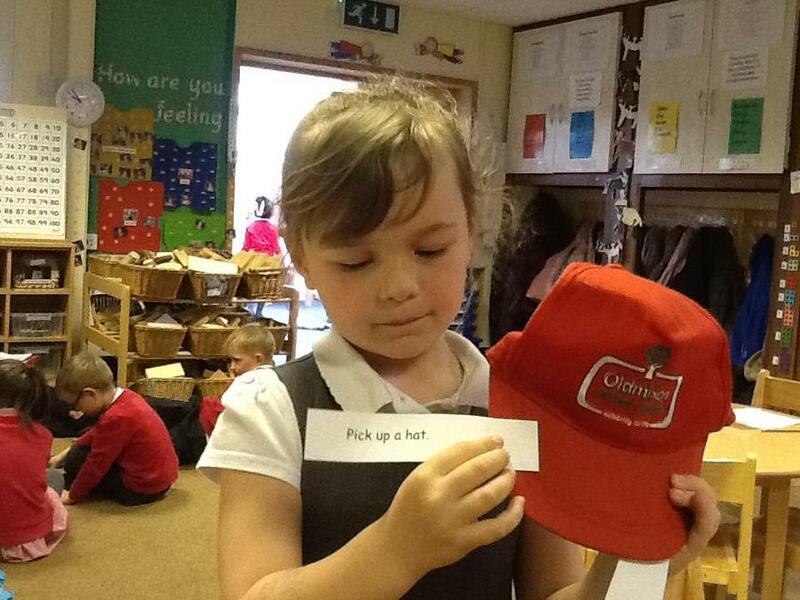 What is a tractor used for? 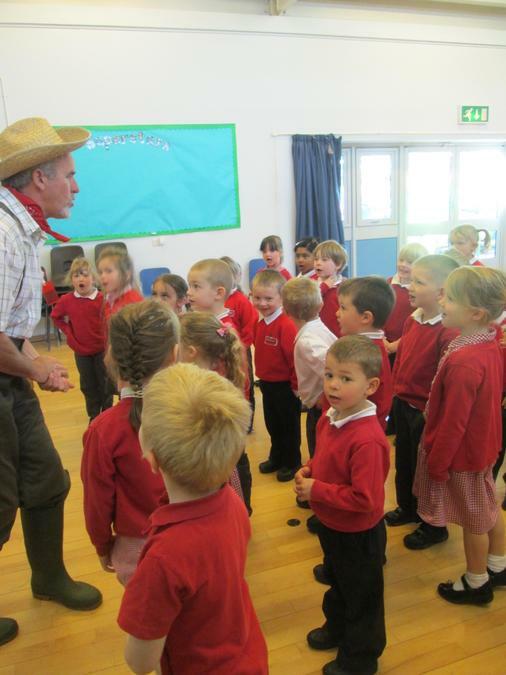 The children enjoyed a visit from farmers from Yeo Valley. 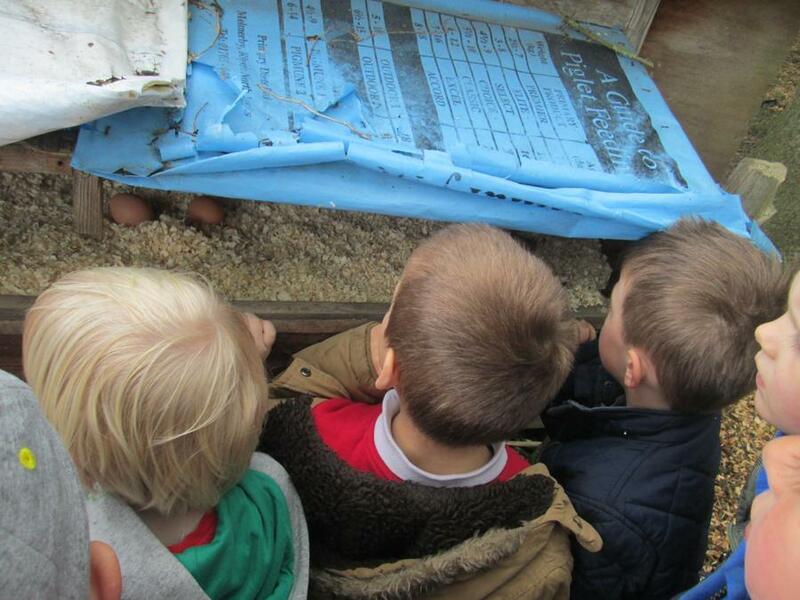 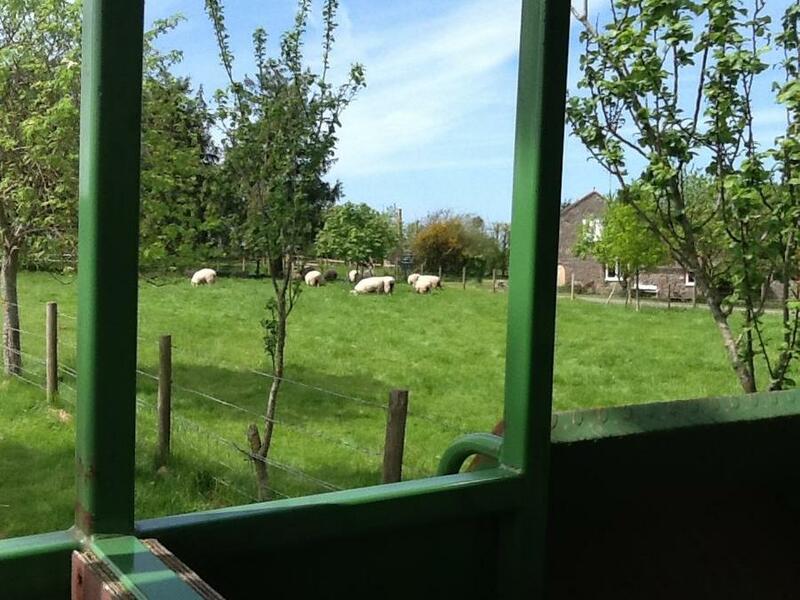 They learnt all about farm animals and the farmer's role on a farm. 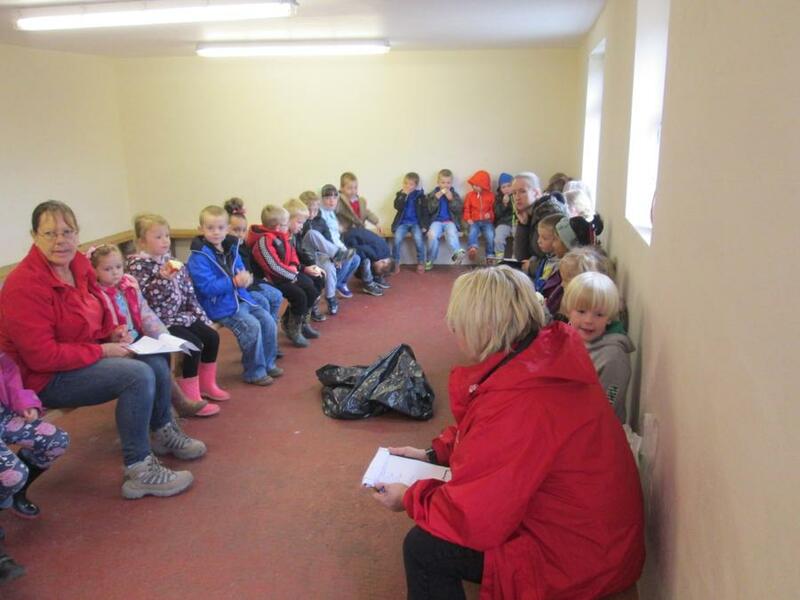 They showed the children what clothes were sensible on a farm and what they need to wear. 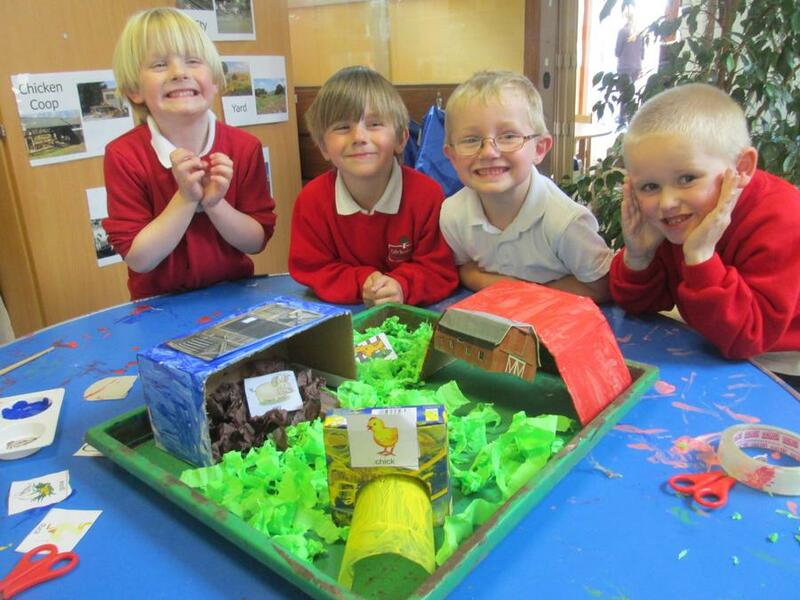 The children enjoyed making farmyards in groups. 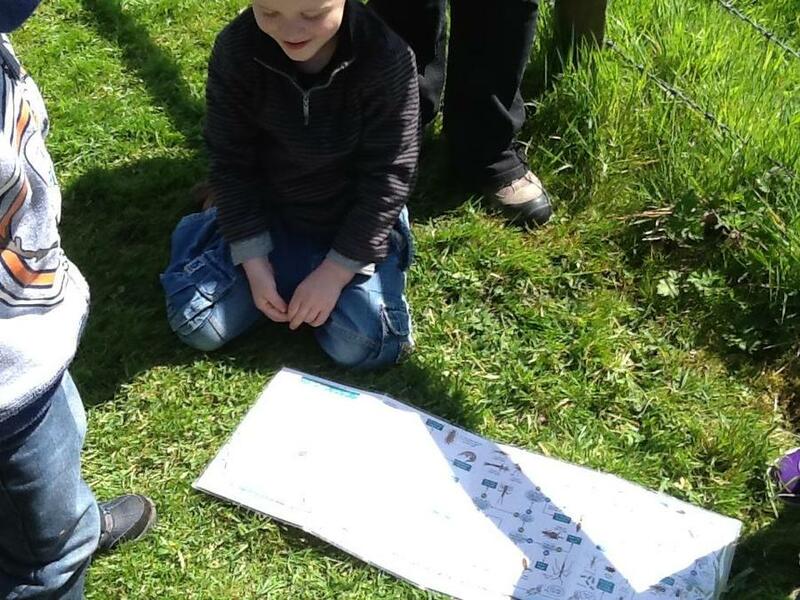 They learnt the names of areas on the farm and improved their knowledge by using this vocabulary in the art activity. 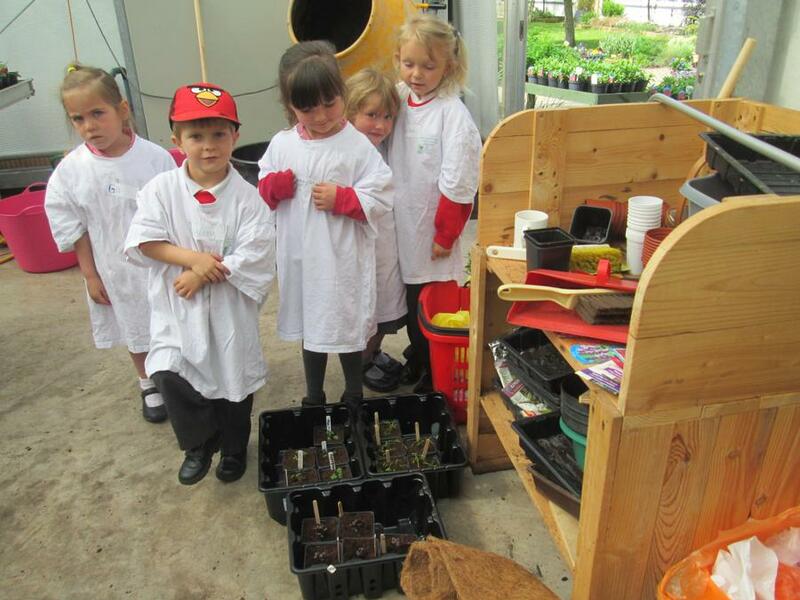 We have a farm shop for the children to explore. 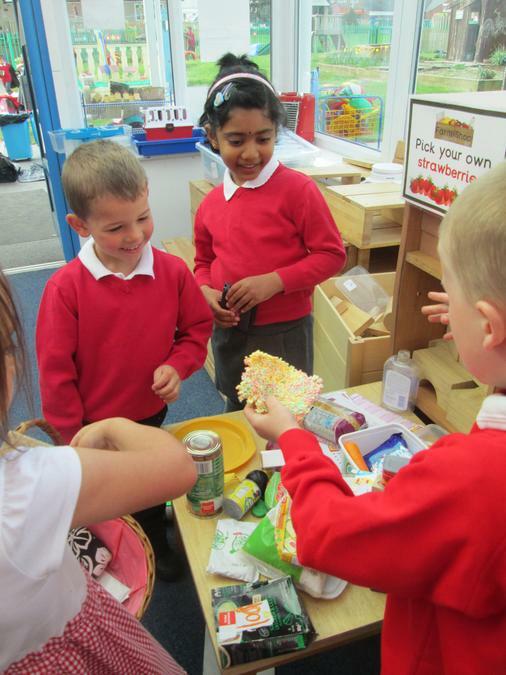 They have enjoyed playing the roles of the customer and the shop keeper. 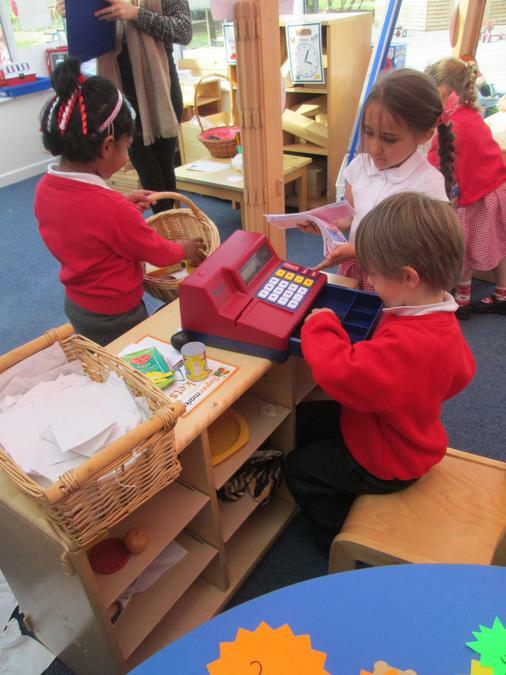 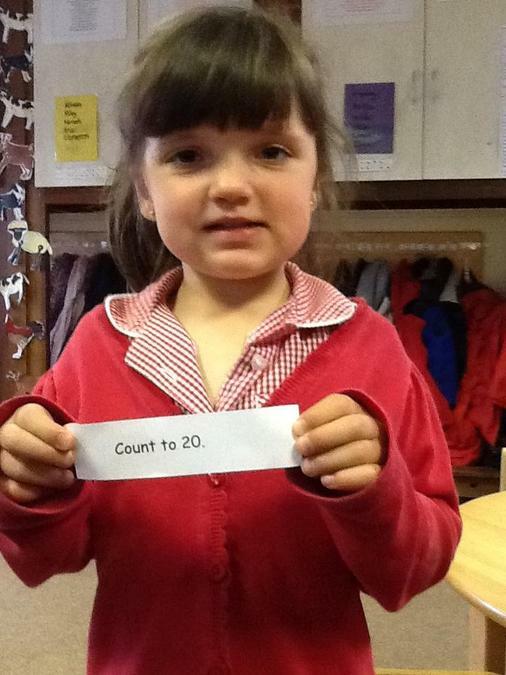 They have been using the till and the money and beginning to use vocabulary linked with money. 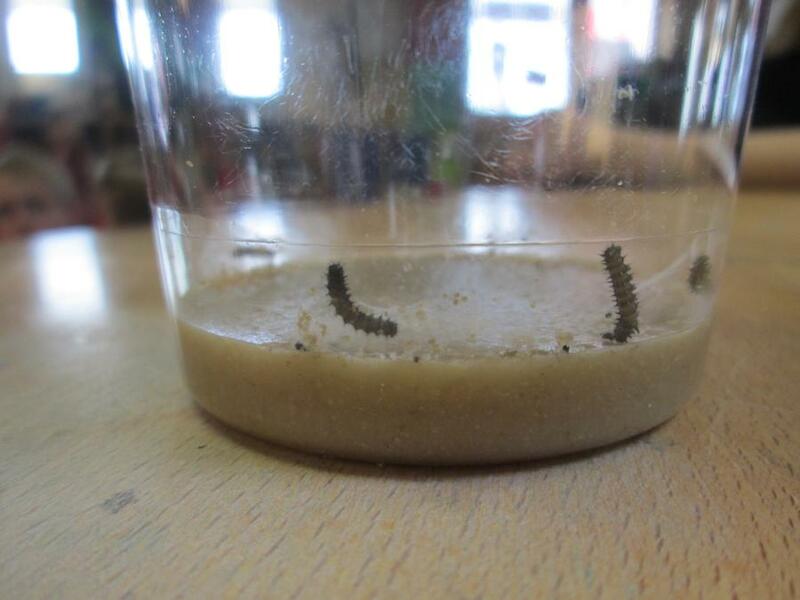 We have now got Caterpillars in our classroom, we are interested in watching them grow and change. 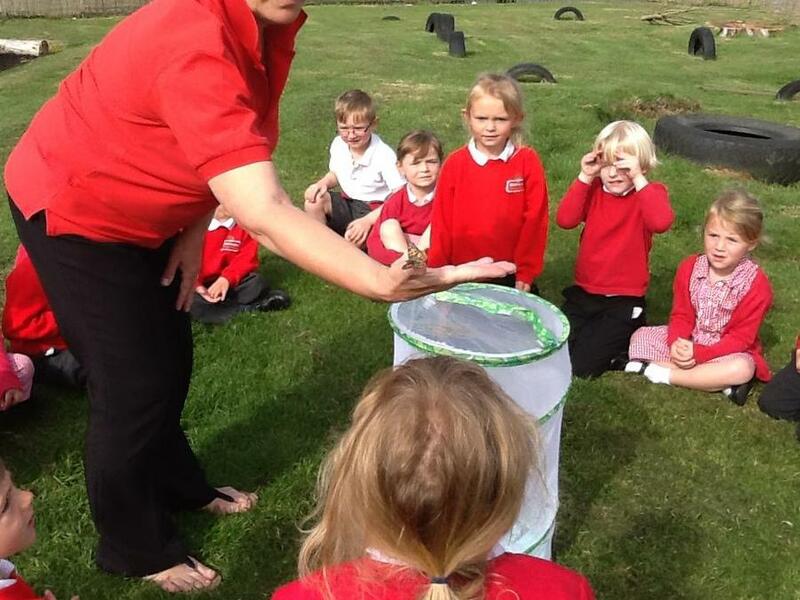 The children have learnt what happens and they are really excited to watch their transformation into butterflies. 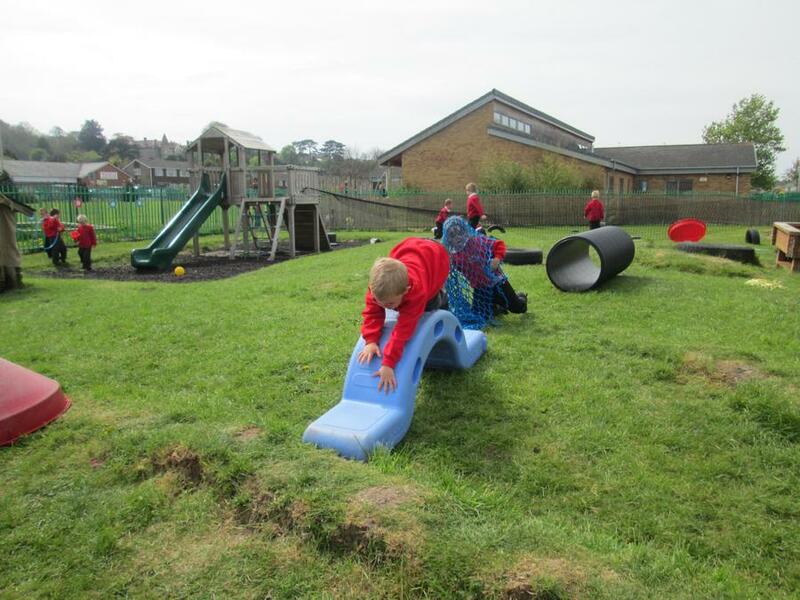 The children have enjoyed being outdoors. 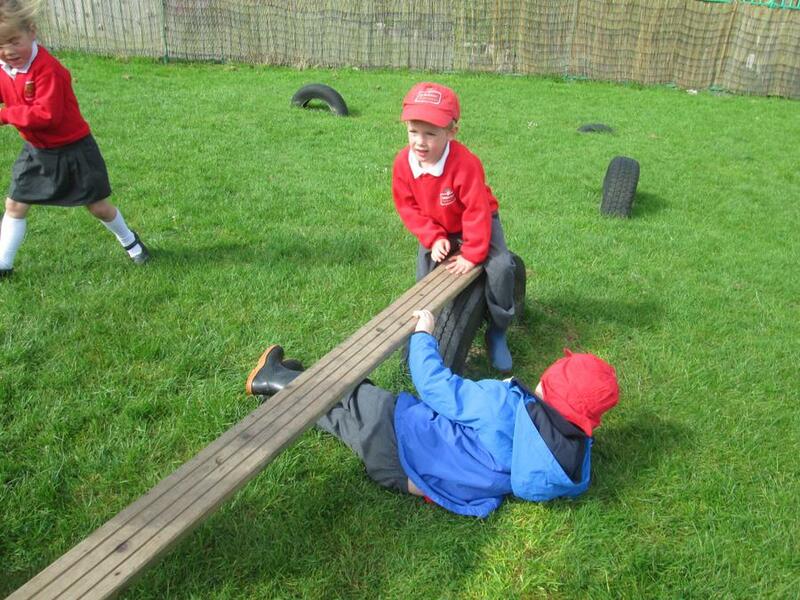 This week we have been working on our confidence to try new activities and find out what we like doing. 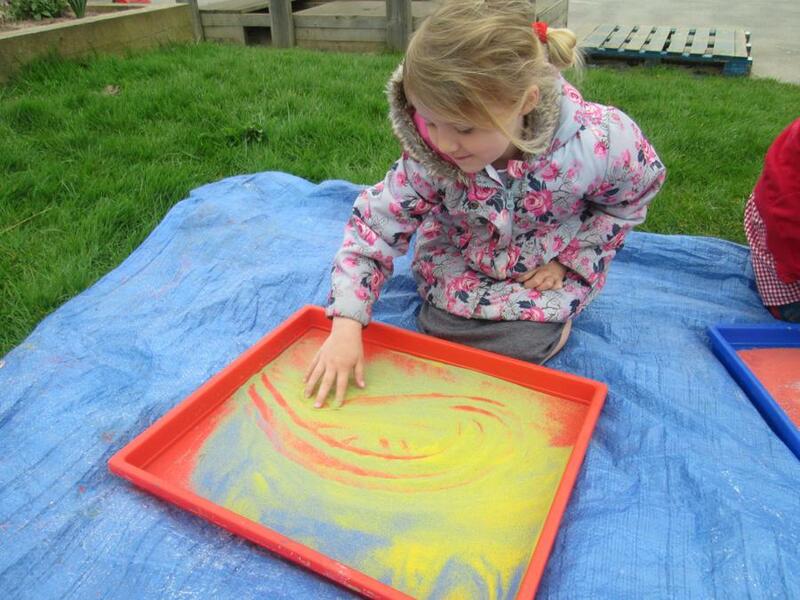 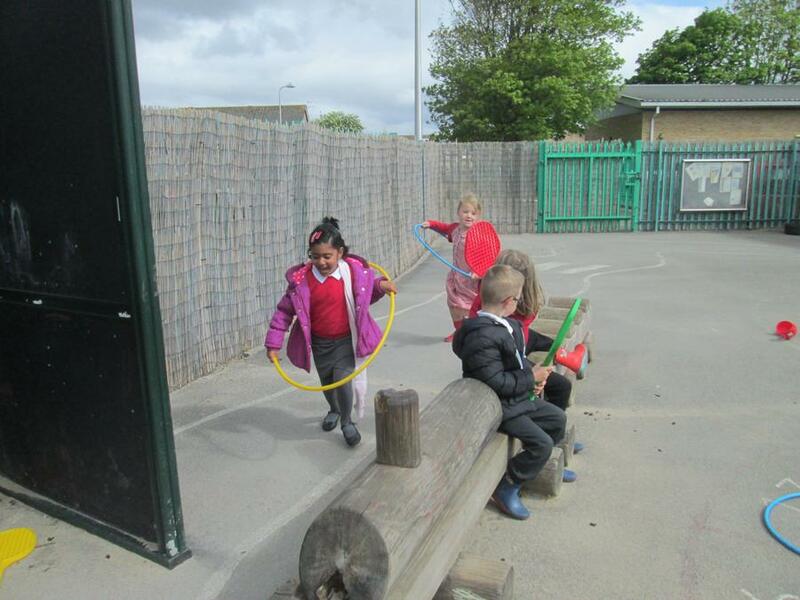 There have been lots of art materials outdoors to create with and P.E equipment that the children can practice their control and movement skills with. 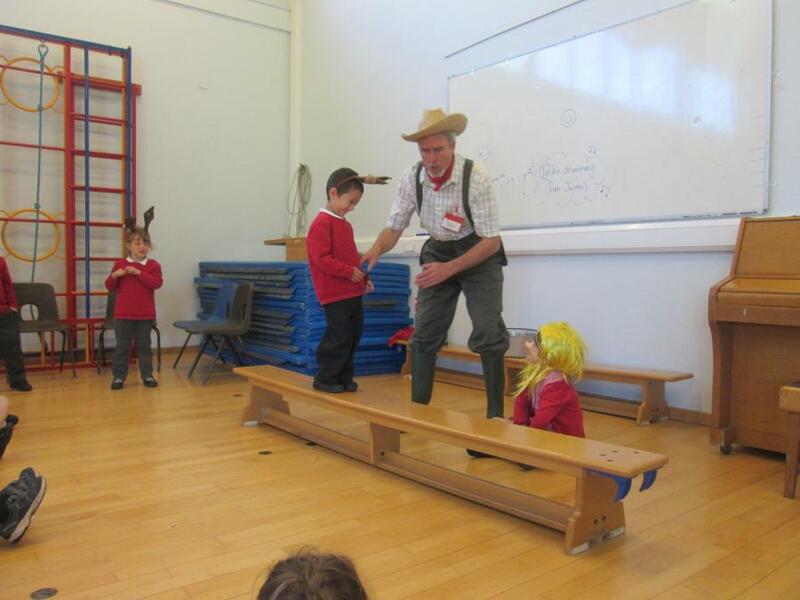 We had a visit this week from Old MacDonald, the children really enjoyed asking him their questions and finding out about his farm. 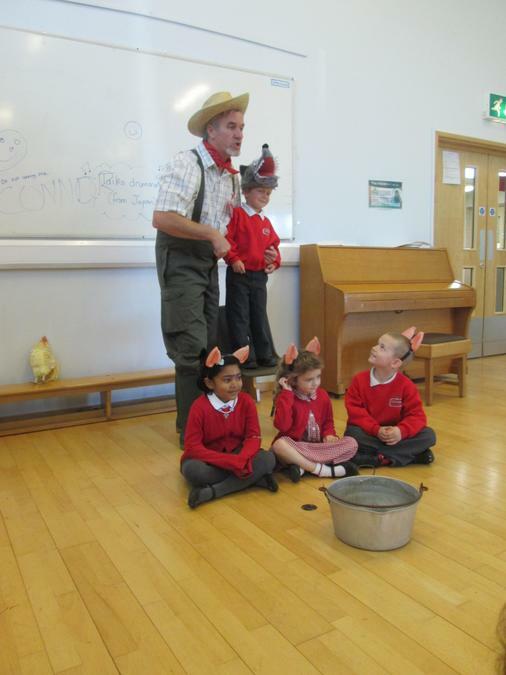 He taught us the Old MacDonald song and a game called 'The Farmer in The Den'. 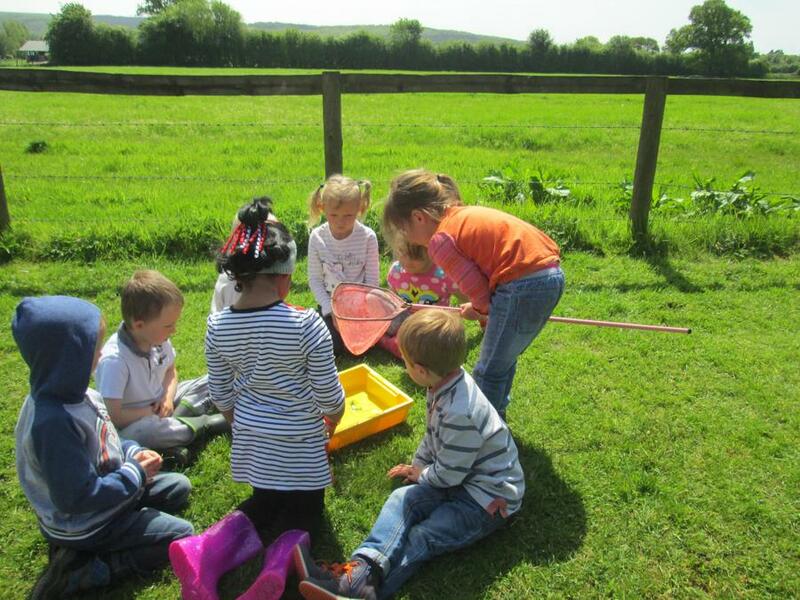 The children loved getting involved with the farm activities. 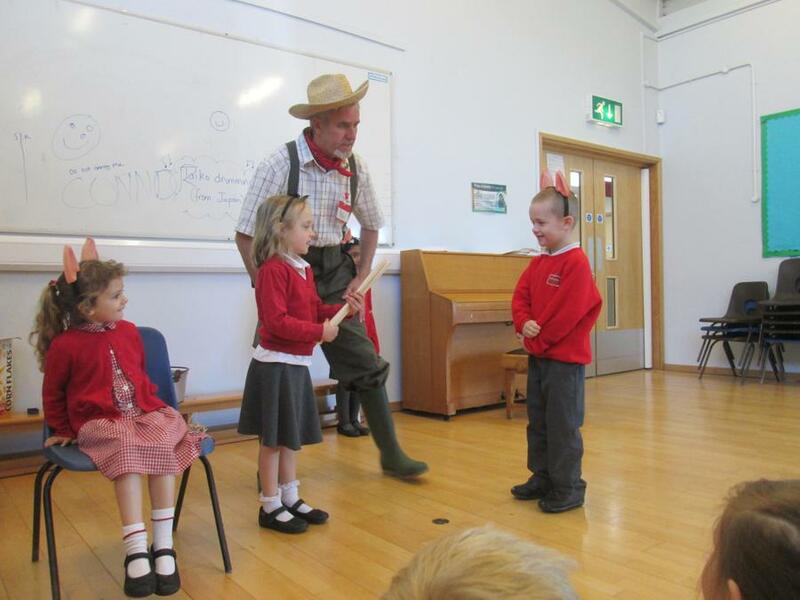 Old MacDonald taught us two stories, 'The Three Little Pigs' and 'Three Billy Goats Gruff'. 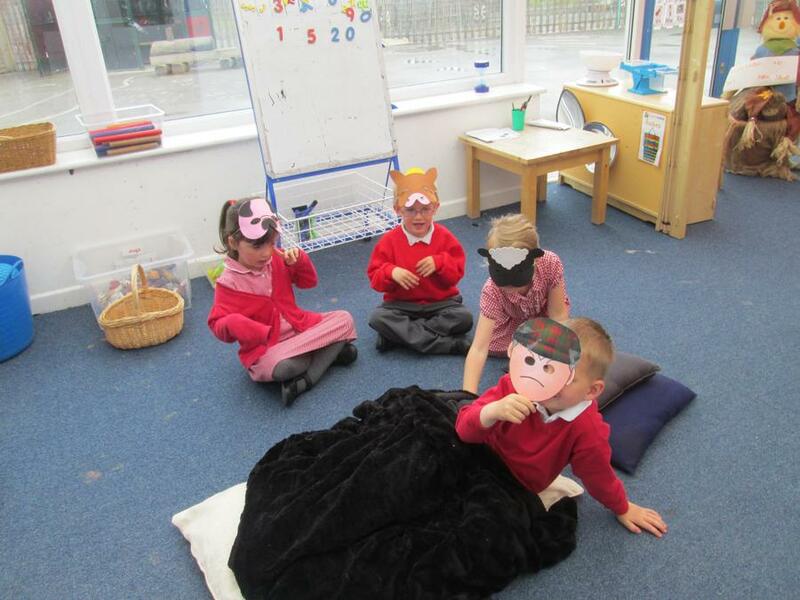 We acted out the stories to learn them, the children enjoyed being different characters and showing their emotions. 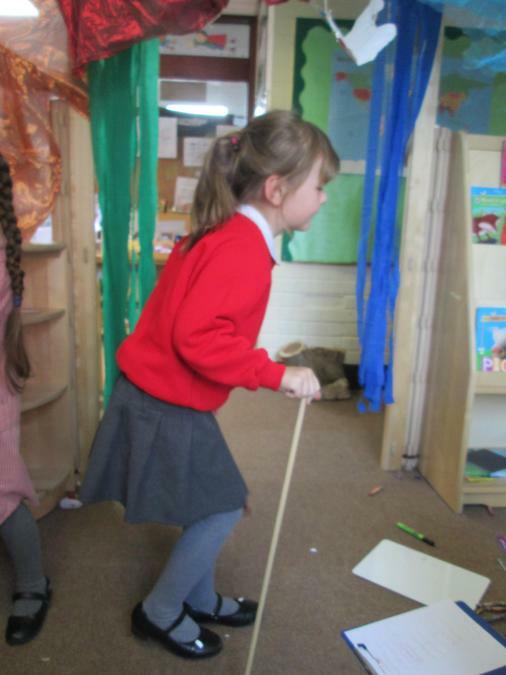 We took this learning further in the classroom by acting out the story independently and recreating our own characters. 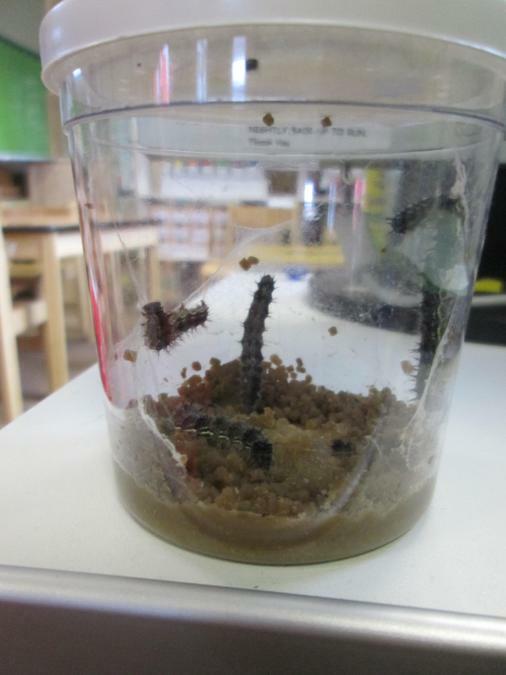 Our Caterpillars are growing and we have been watching the transformation they are going through. 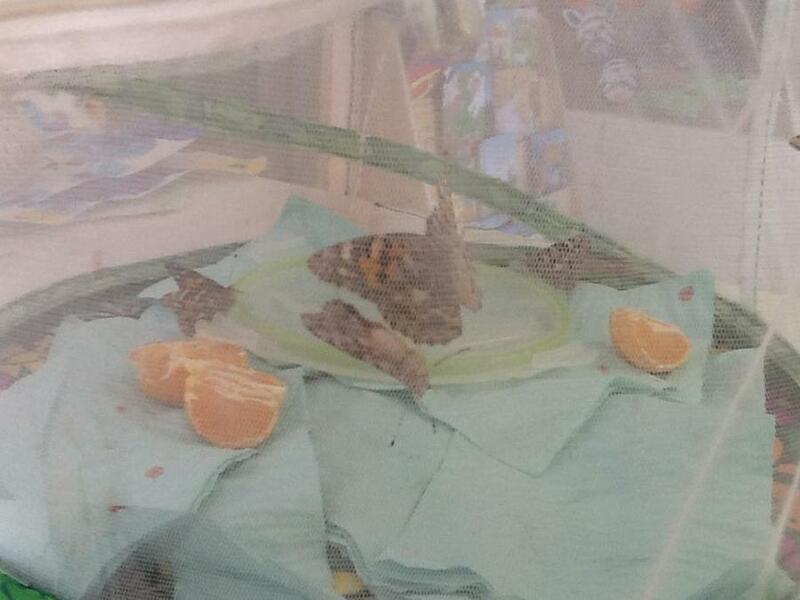 We are waiting for them to wrap themselves up and make a cocoon so they can grow into butterflies. 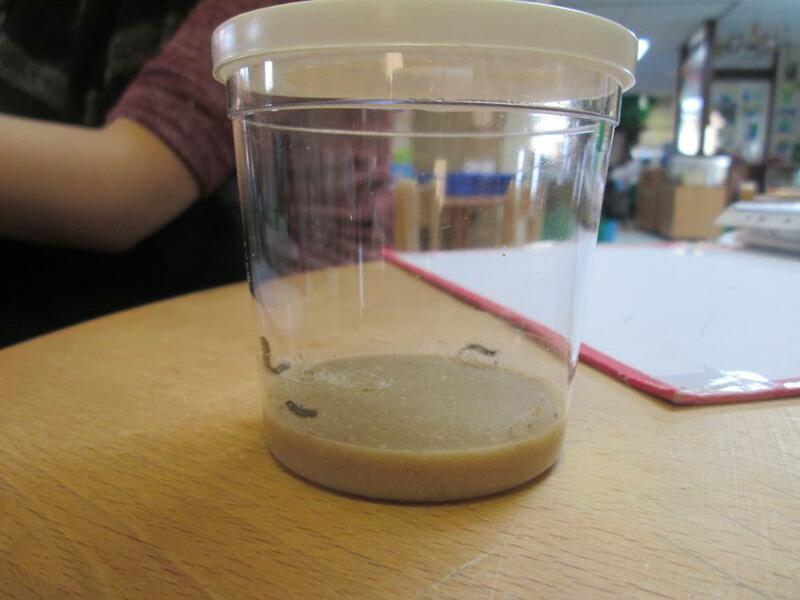 We have been observing the caterpillars to find out what they look like and how they move. 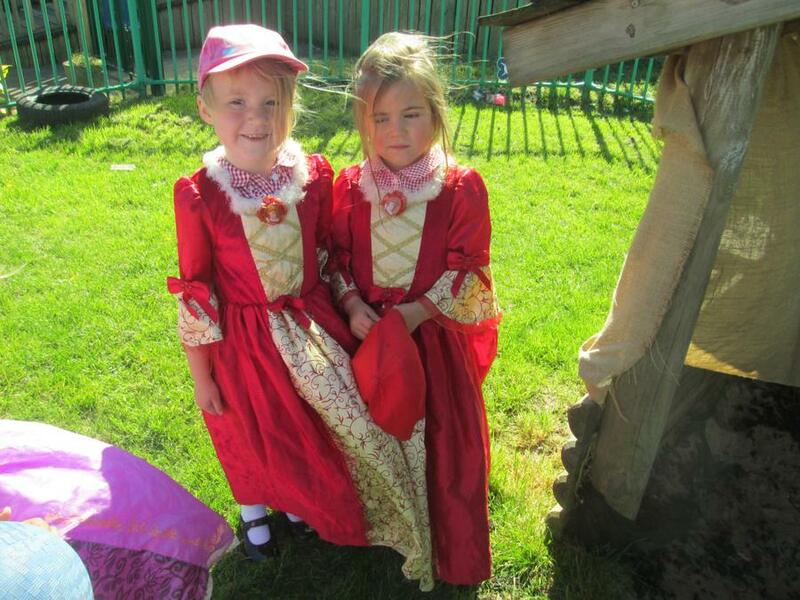 We have been enjoying dressing up this week and exploring stories outdoors. 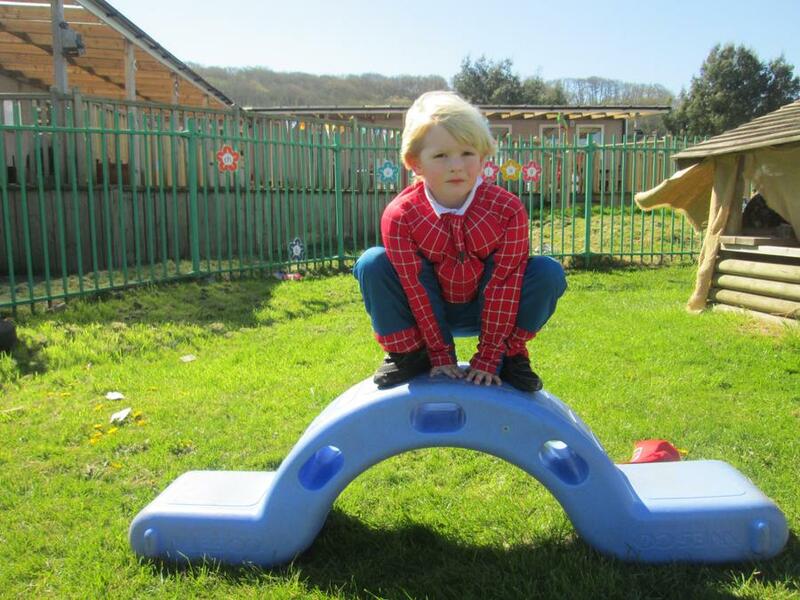 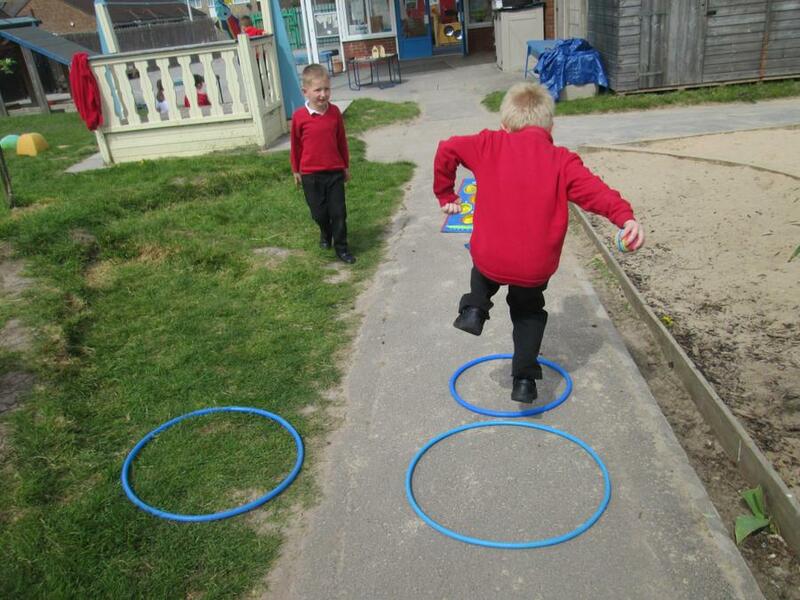 We have also been using the physical equipment to practice moving outdoors. 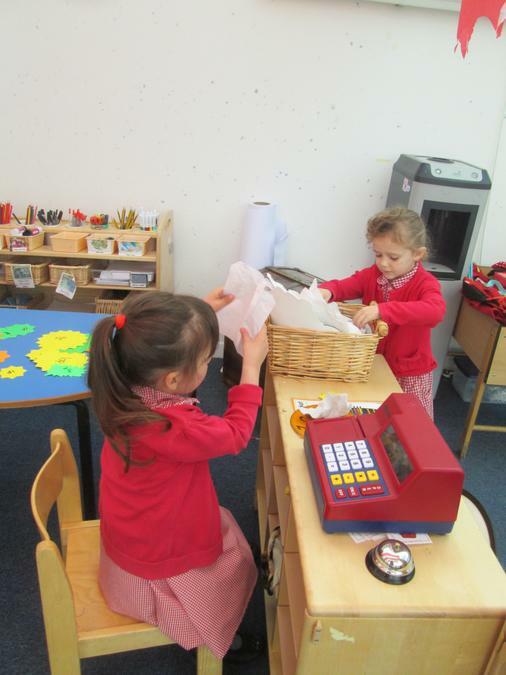 We have practising adding pennies together. 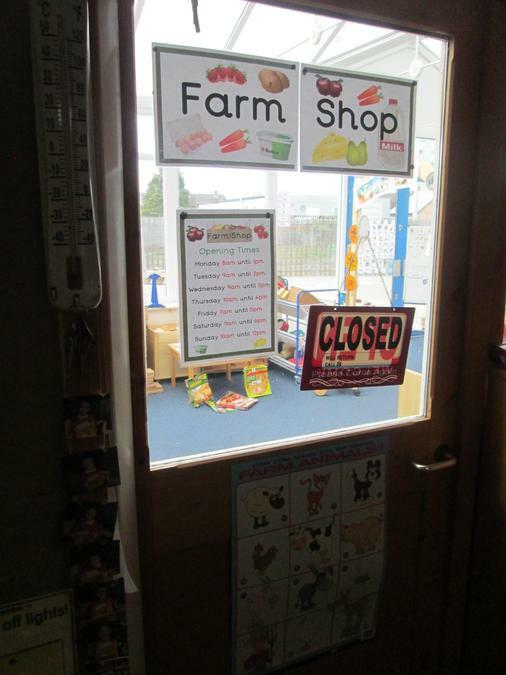 The children have enjoyed using the farm shop and role playing customers and shop assistants. 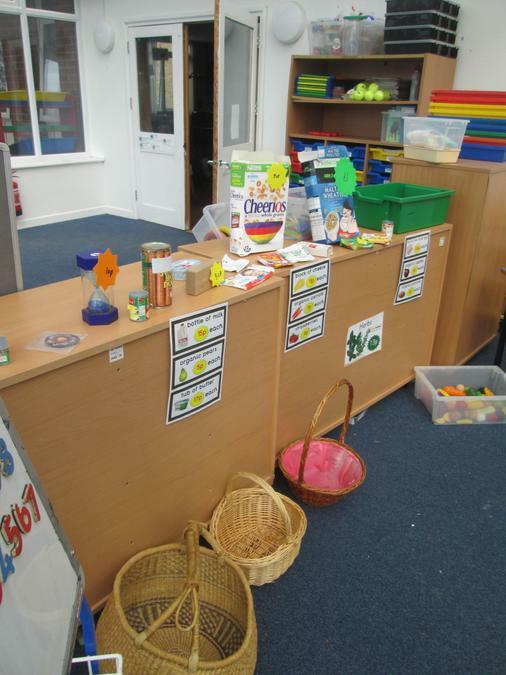 In the farm shop the children can buy fruit and vegetables, we have been discussing healthy eating and ways to help our bodies to grow. 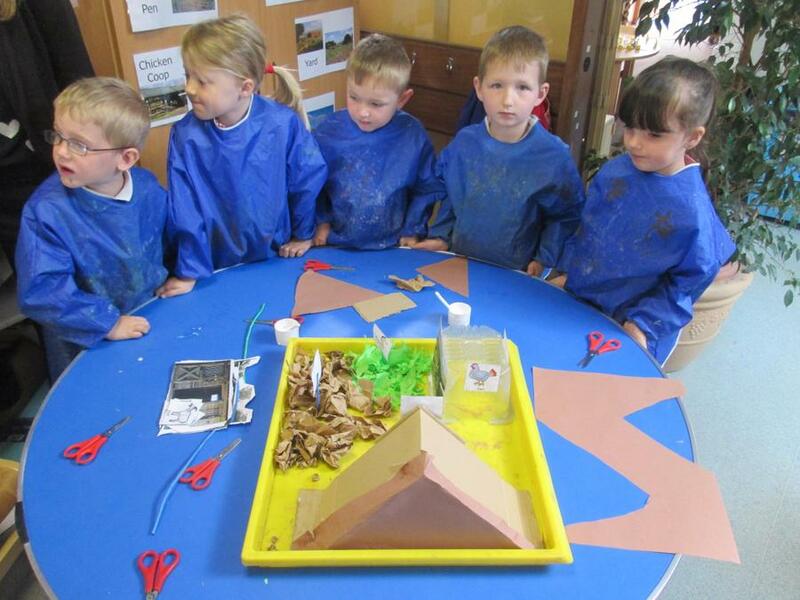 This week the children have been exploring with a wide range of resources. 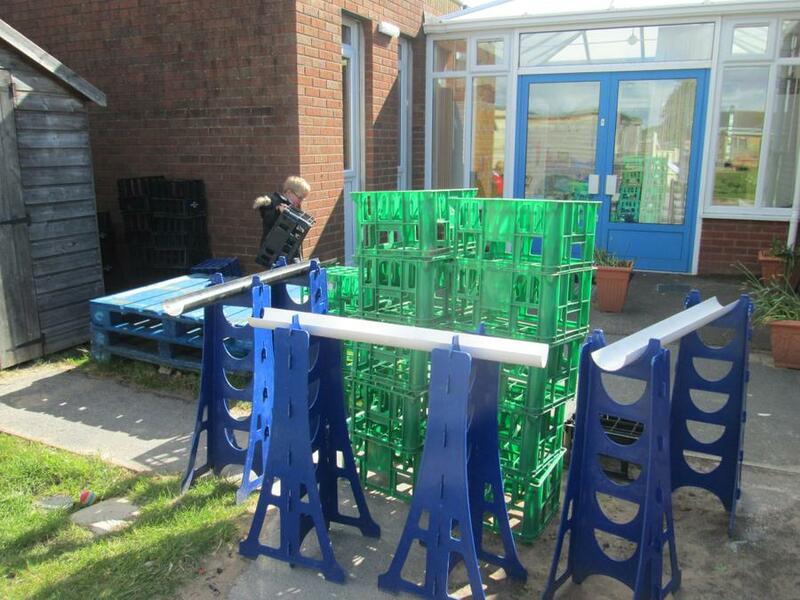 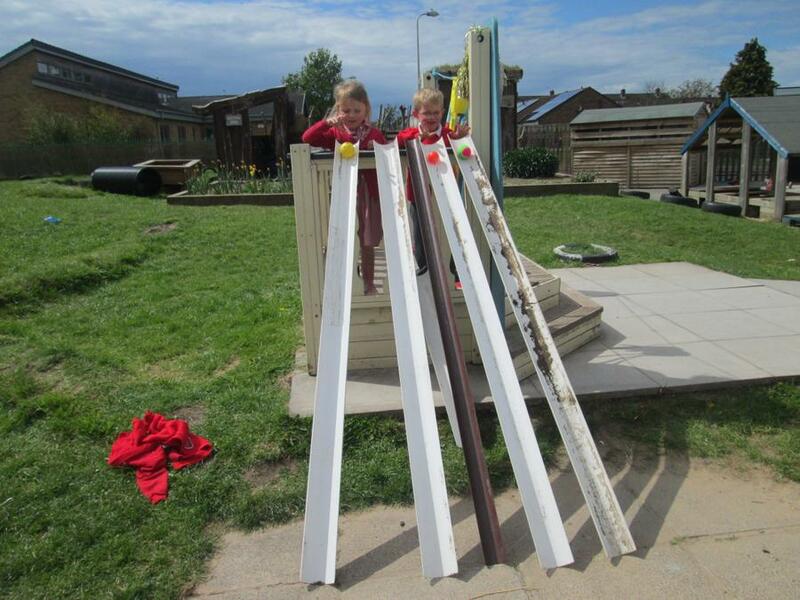 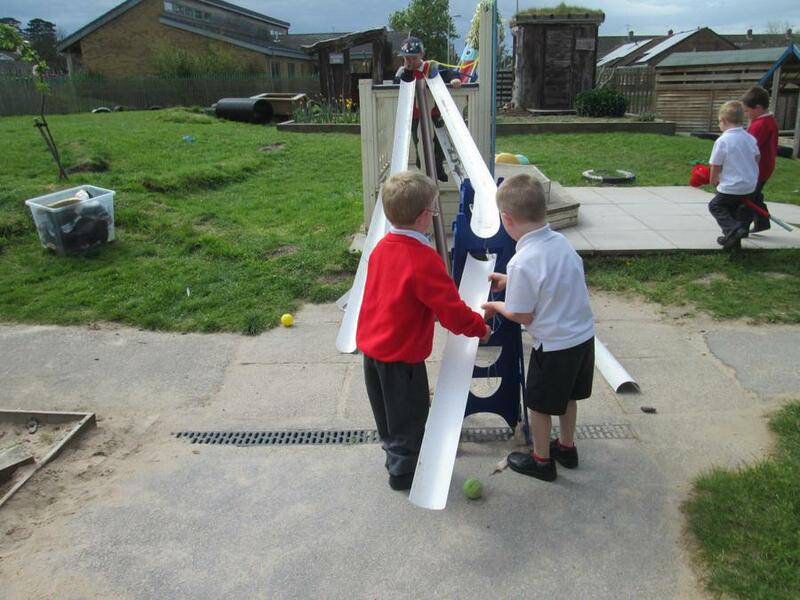 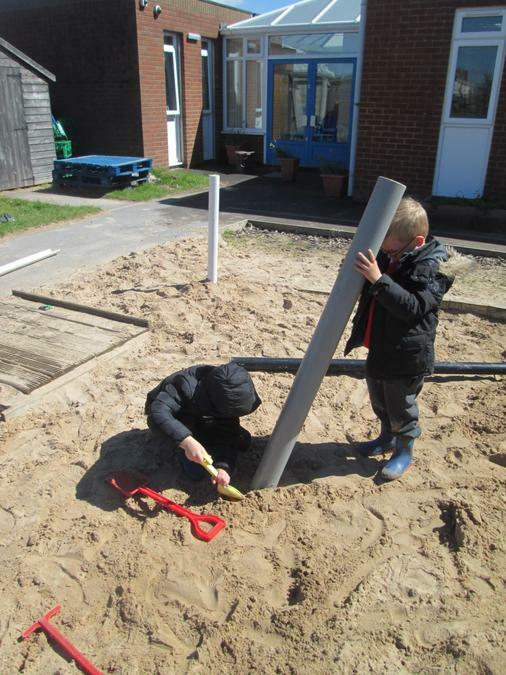 Outdoors we have put out drain pipes and allowed the children to explore with them. 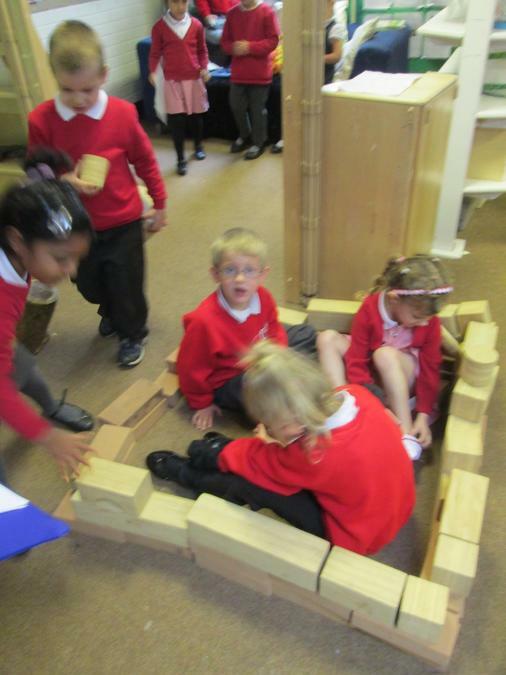 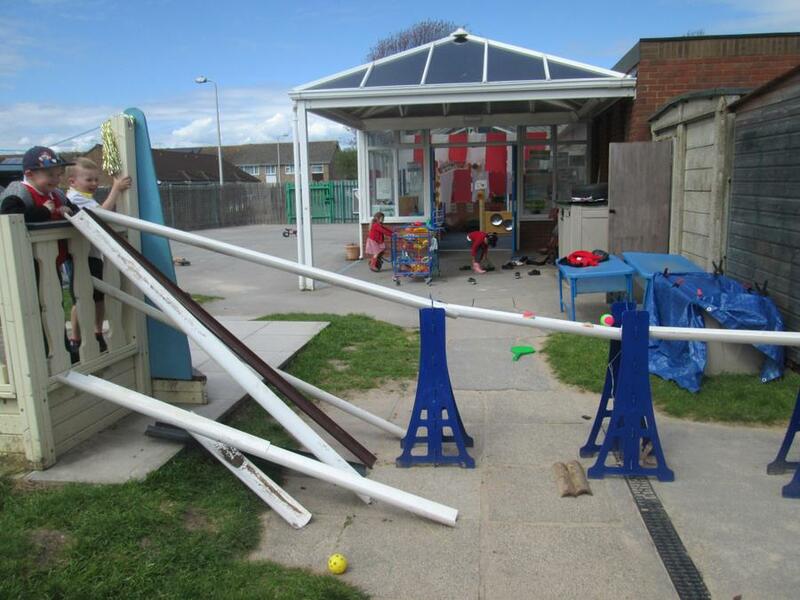 The children used their imaginations and created bridges, car races down the pipes, build towers and loved exploring with the pipes. 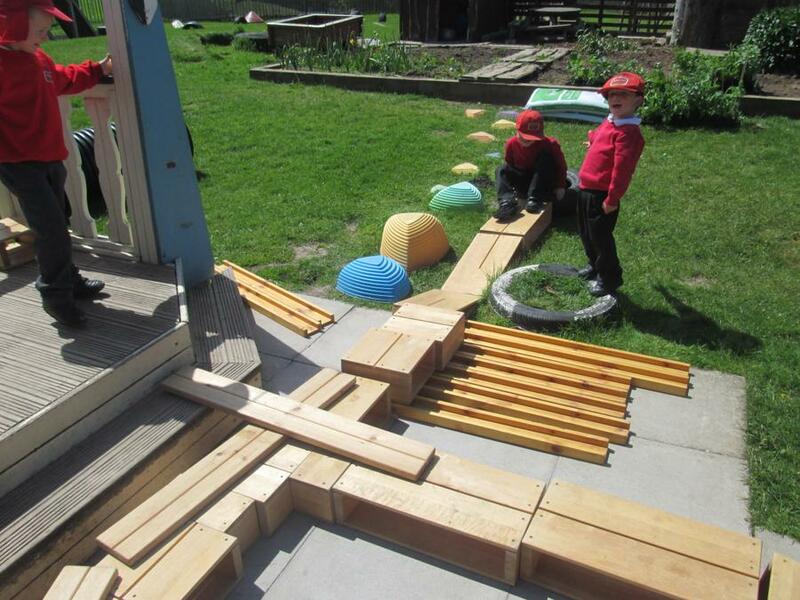 We looked at planning our construction before and then they were able to think about what they were building and how it would work. 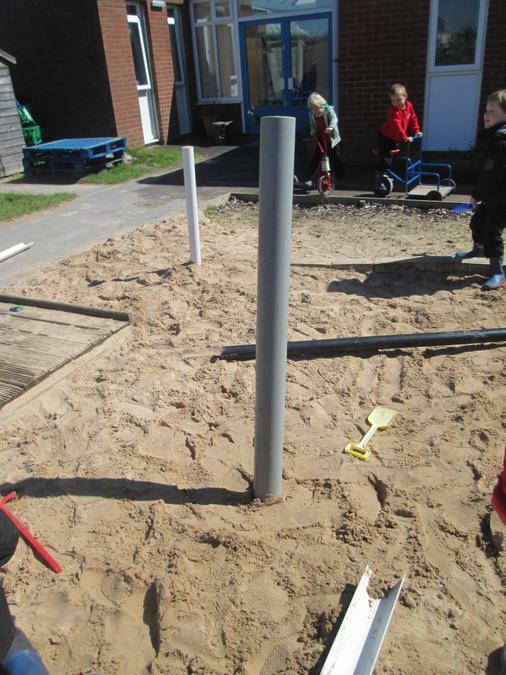 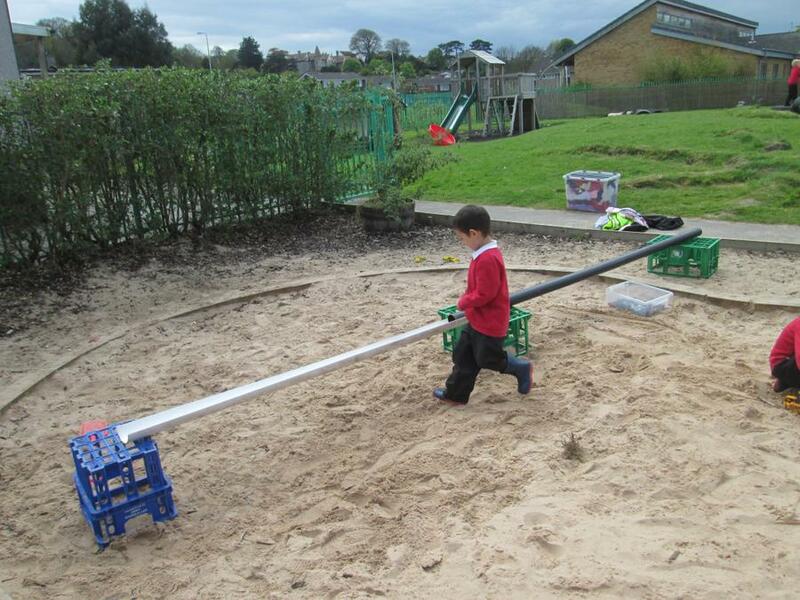 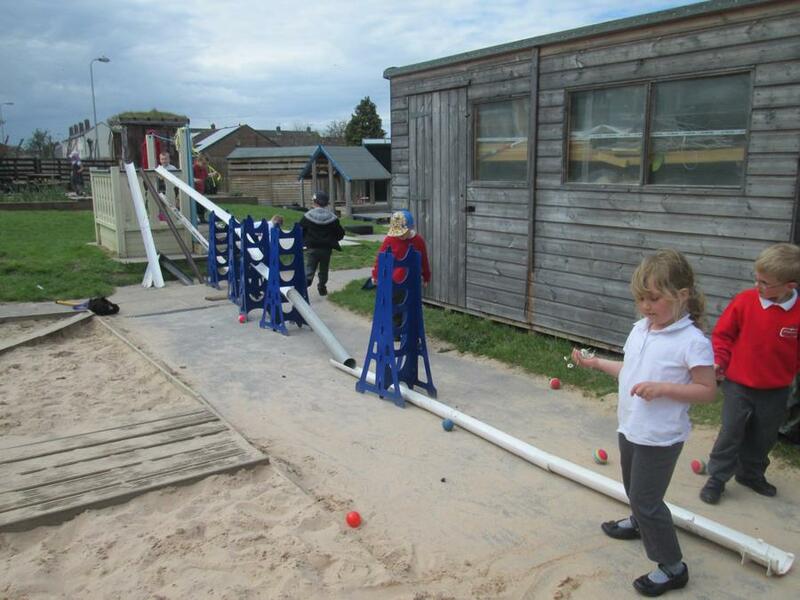 Later in the week they used the drain pipes in the sand and explored making towers. 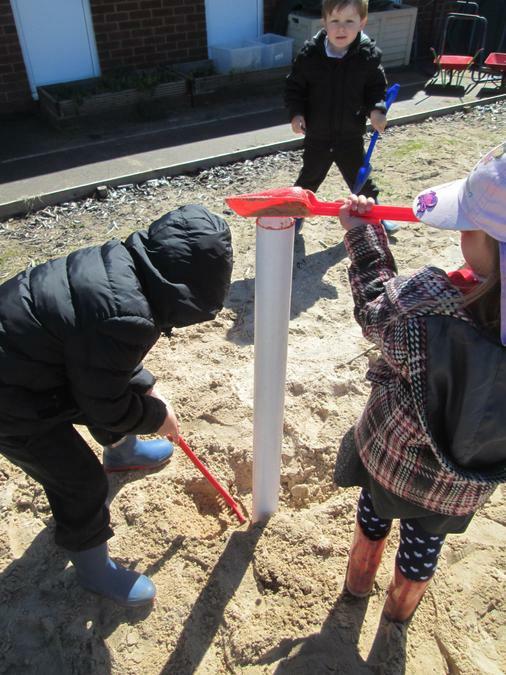 The children used spades to dig holes in order for the pipes to stand up then they created support for them so they would stand up. 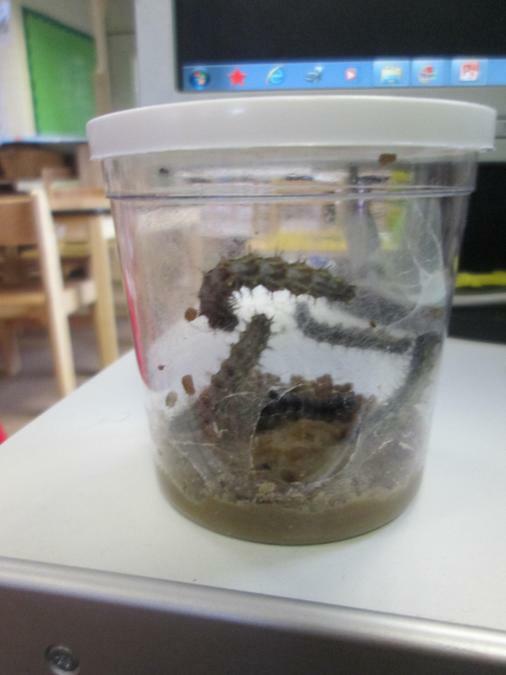 Our caterpillars are now in the butterfly net, they have wrapped themselves up into a cocoon and we are waiting for them to wake up with beautiful butterfly wings. 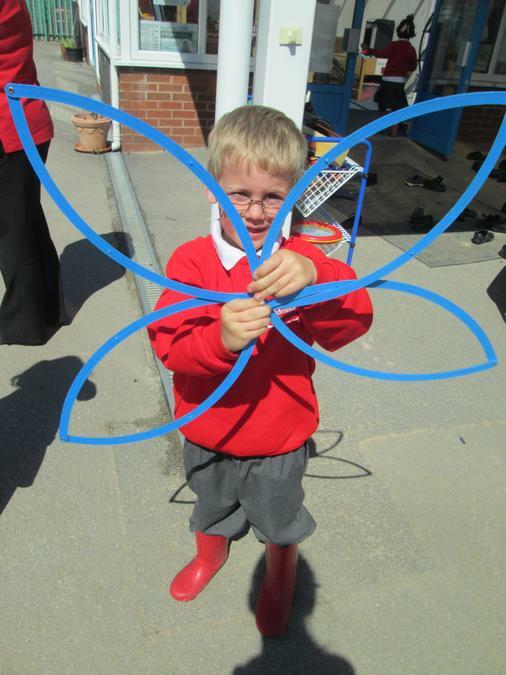 This week we have been exploring butterfly wings and the symmetrical pattern they have. 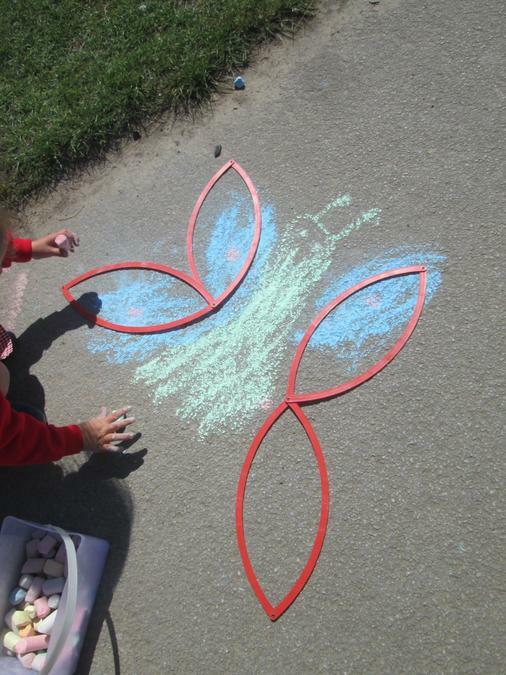 We have created our own using chalk, paints and objects. 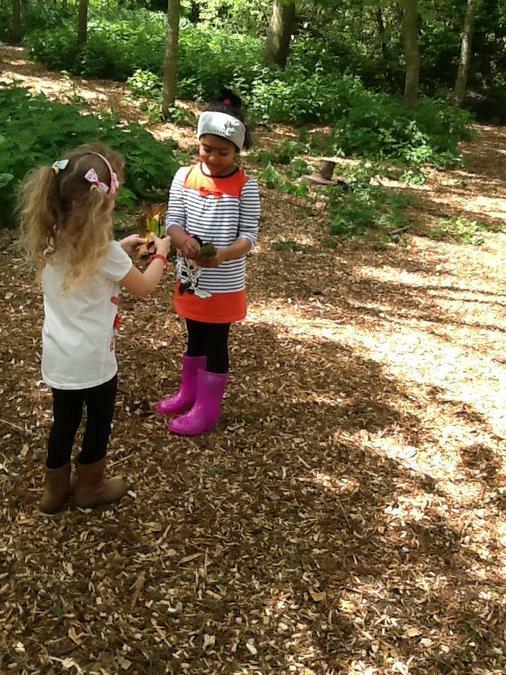 The children then searched outdoors for them, they look all around the flowers as they had learnt that butterflies feed from flowers. 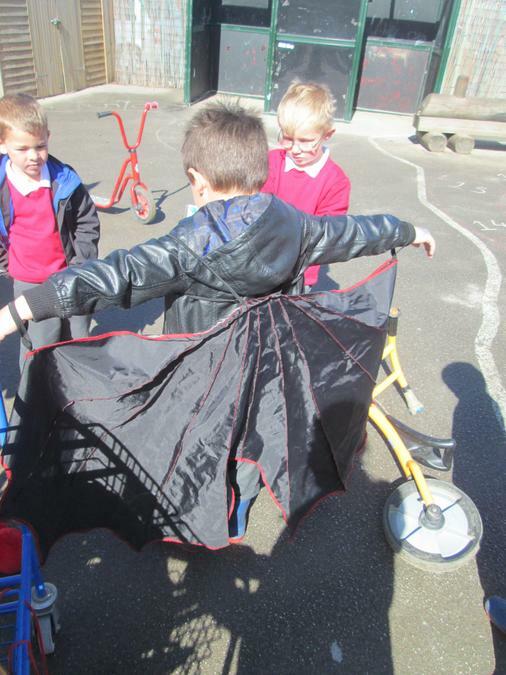 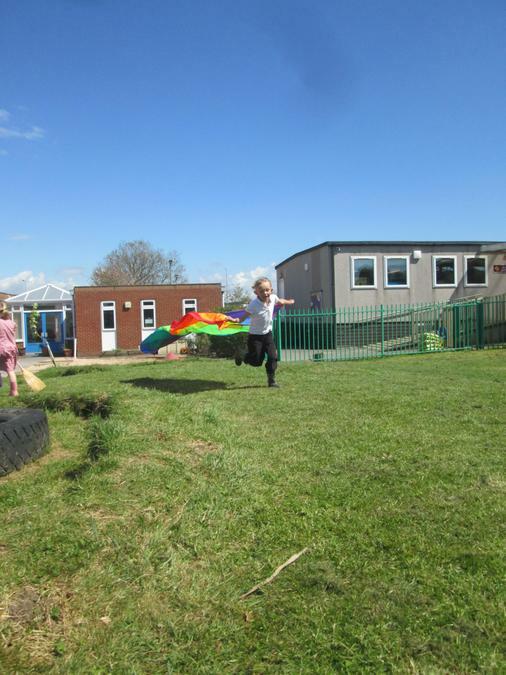 The children experimented with ways that we could fly. 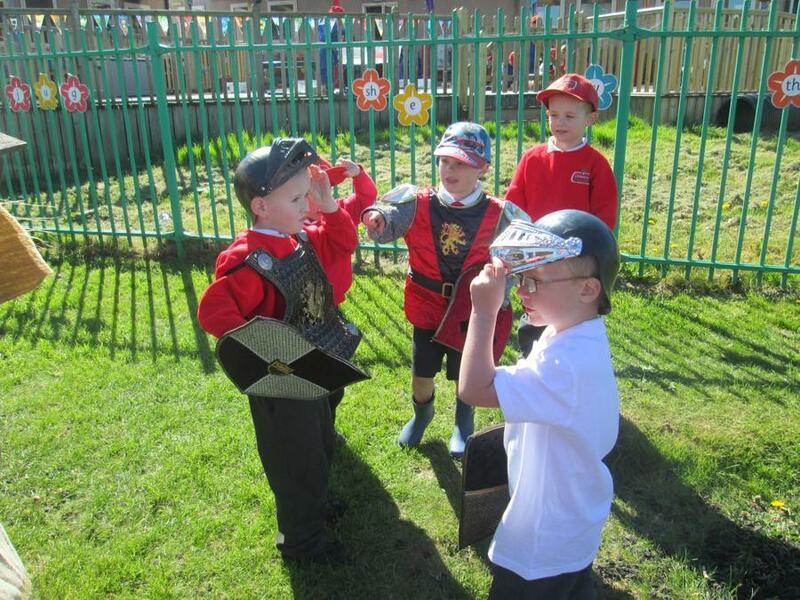 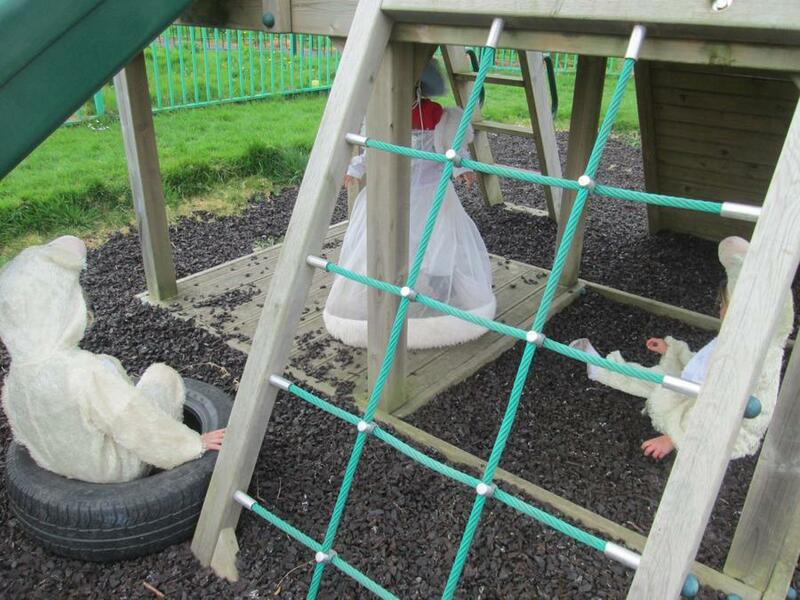 The children used dress up clothes, brooms and parachutes to do this. 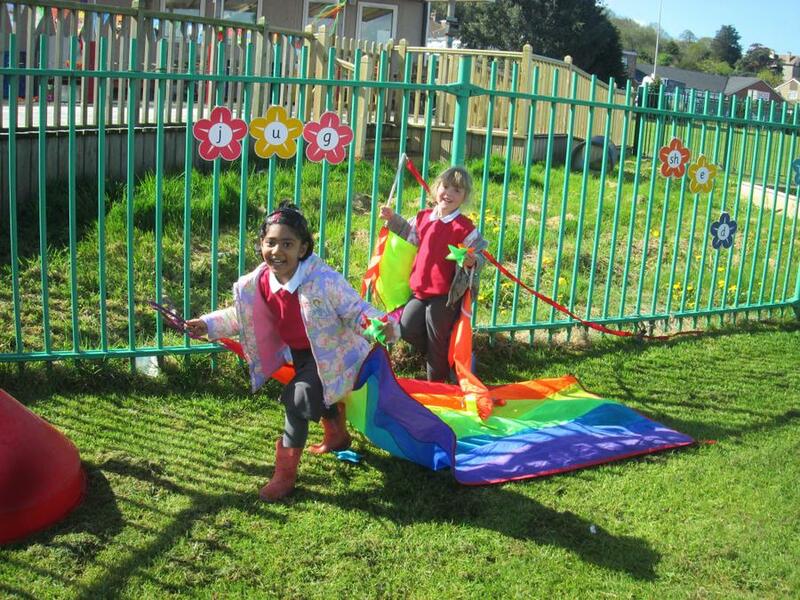 They loved exploring with their movements and role playing a butterfly. 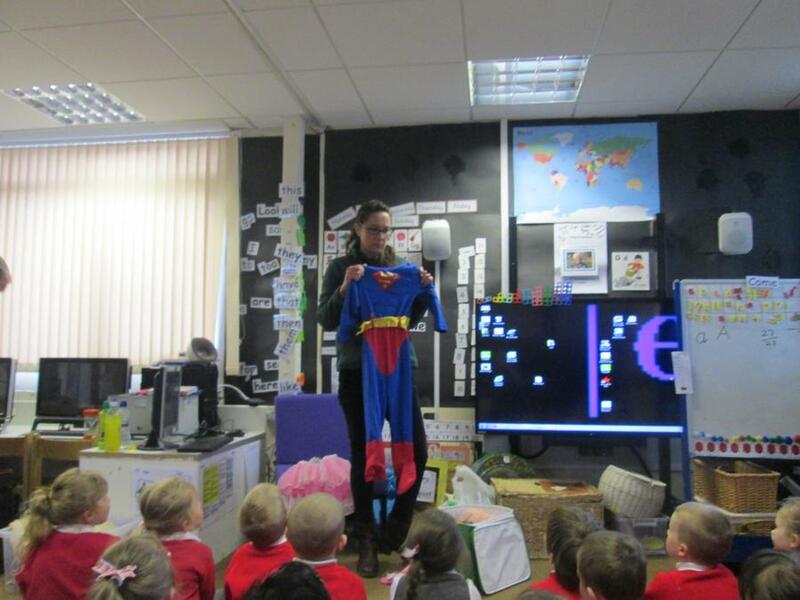 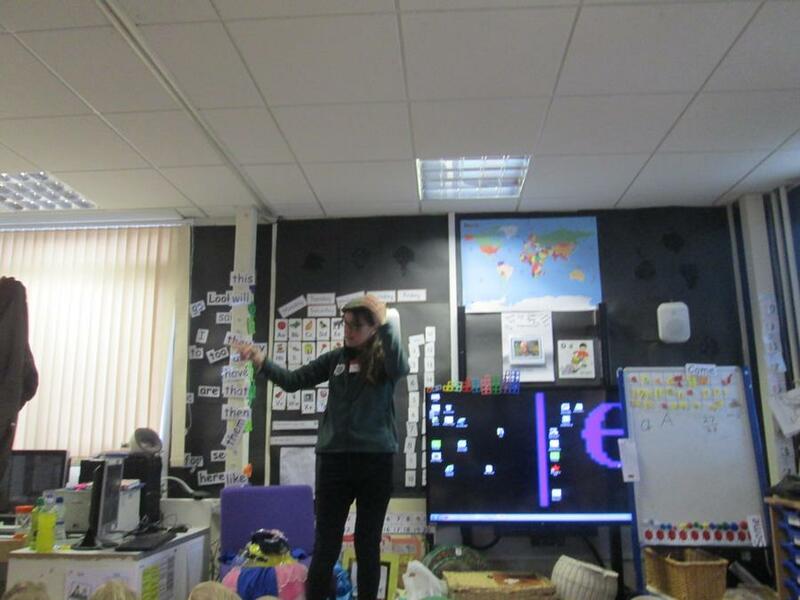 This week we had a visitor come to talk to us about where our breakfast comes from. 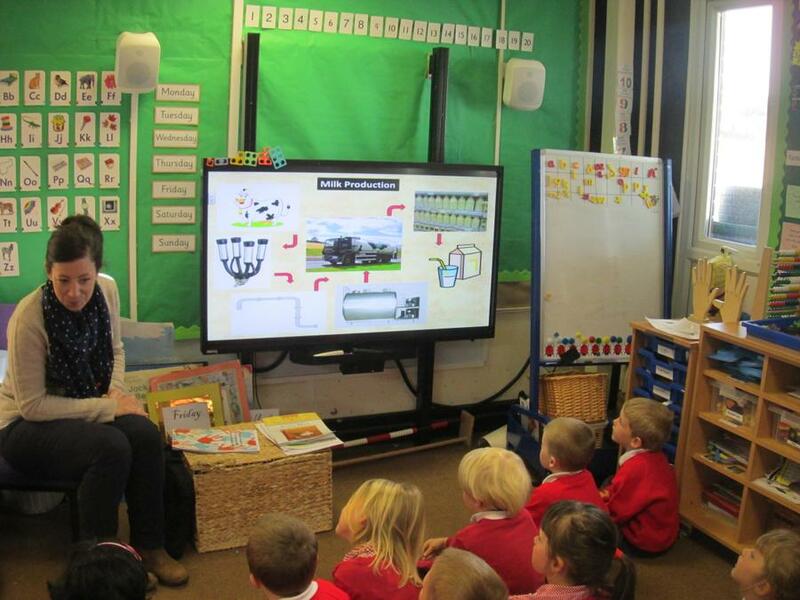 She taught us all about the collection of milk and how it is produced. 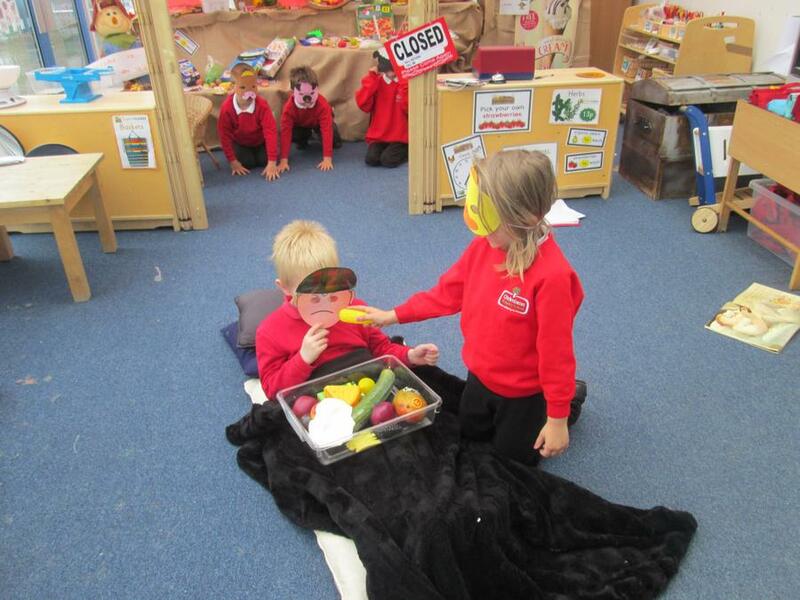 Reception now know that they must eat their breakfast as it helps our bones to stay strong and our bodies can grow from the food we eat. 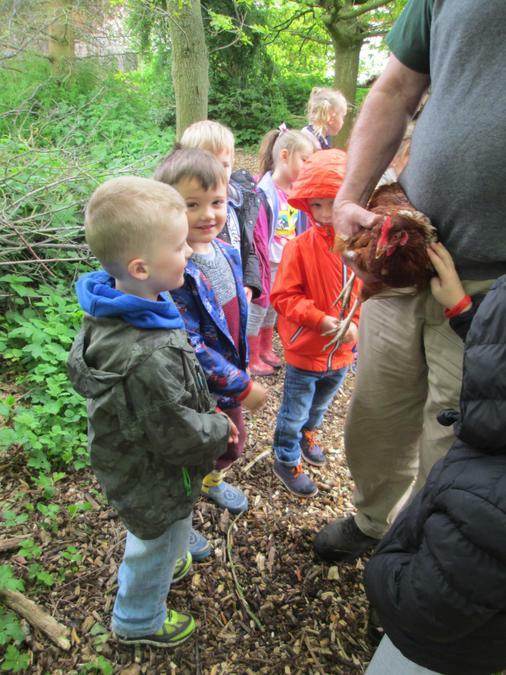 We had our first group of children go to Westhaven this week, they had a great time and told us all about it when they got back so the other children are all really excited to have their turn. 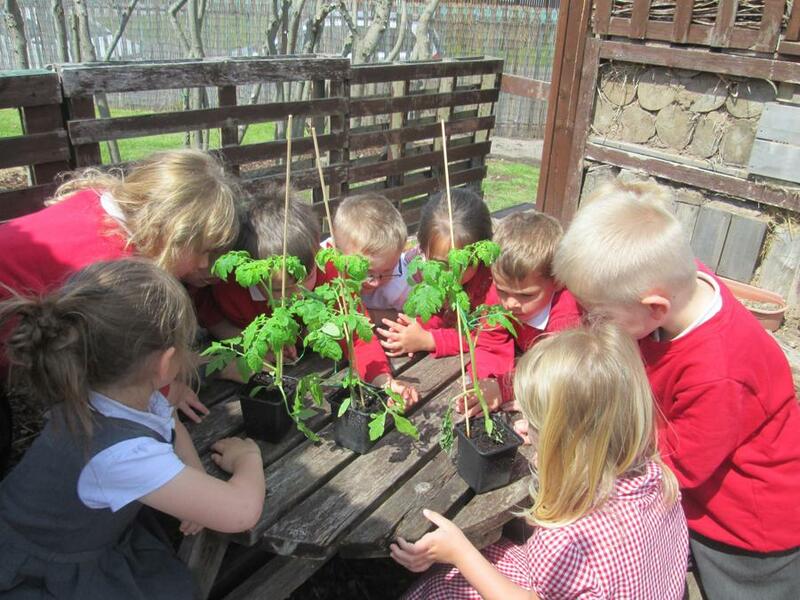 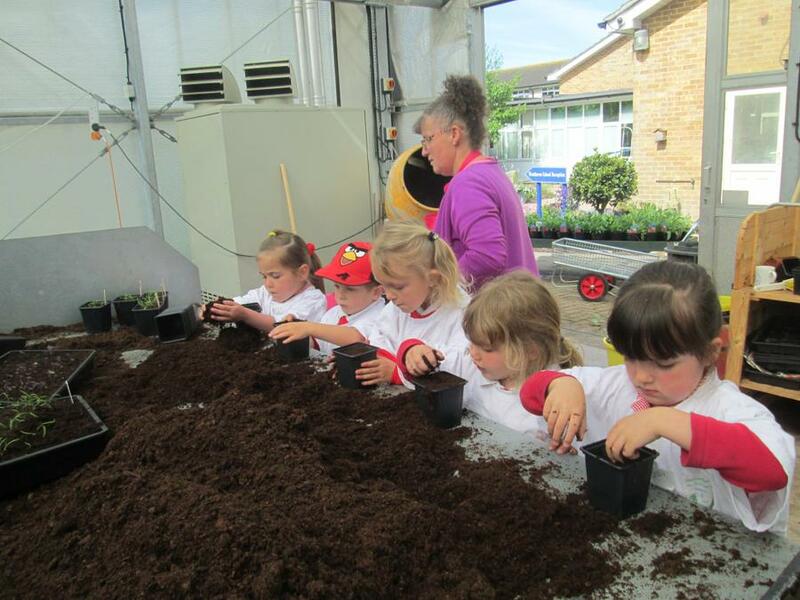 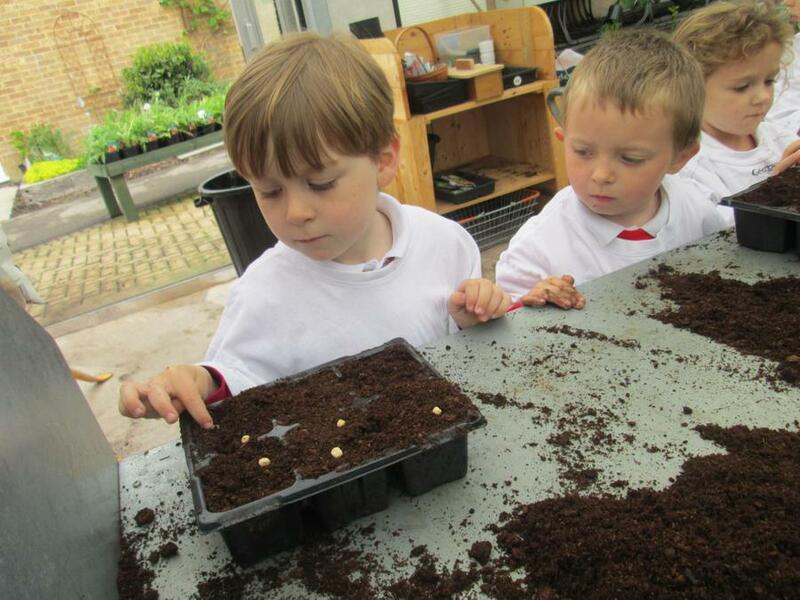 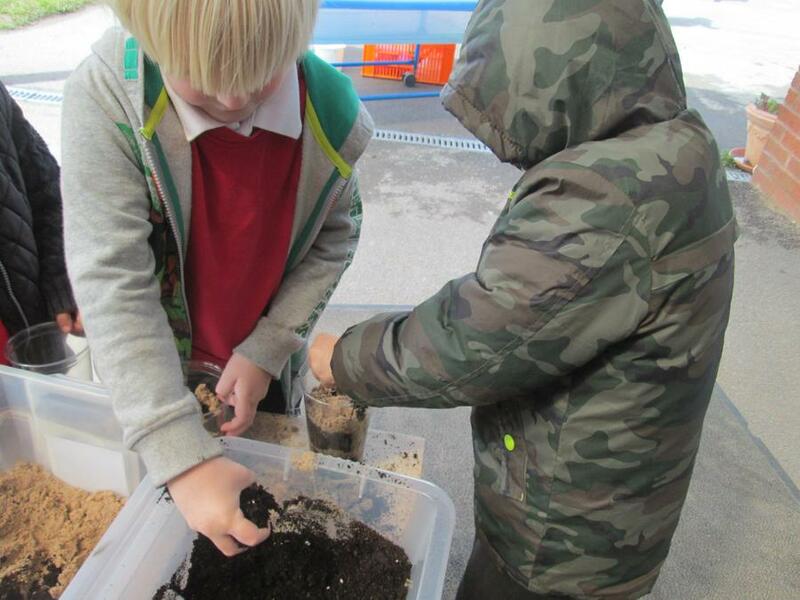 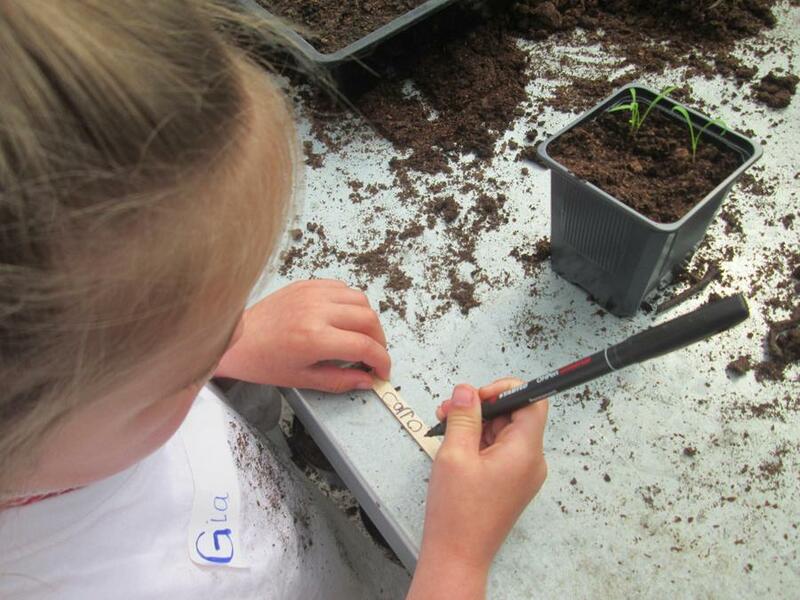 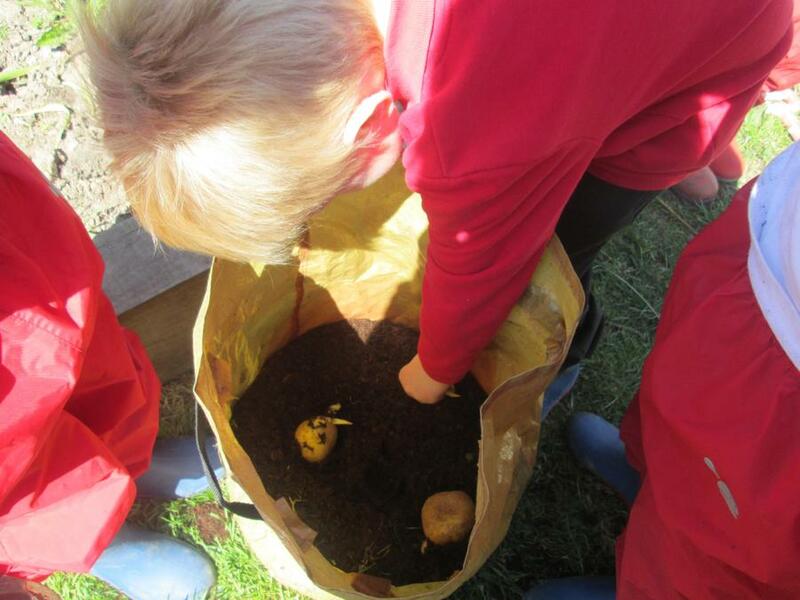 The children looked at different seeds and got to use the soil to grow their own plants. 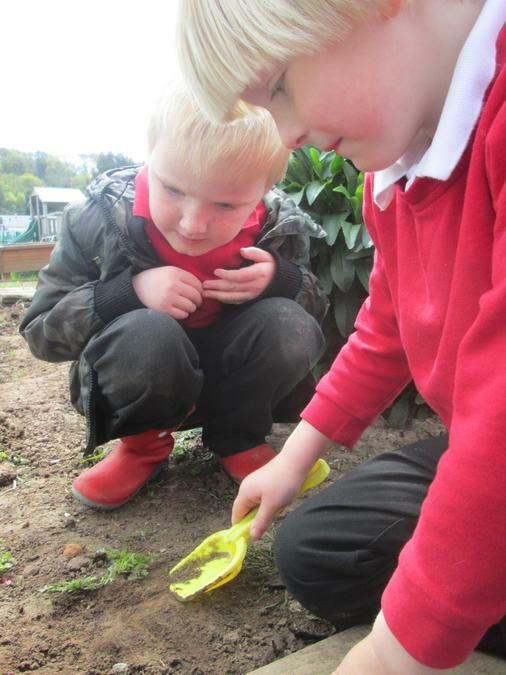 They explored with the resources to find out what objects were and what their role was in growing plants. 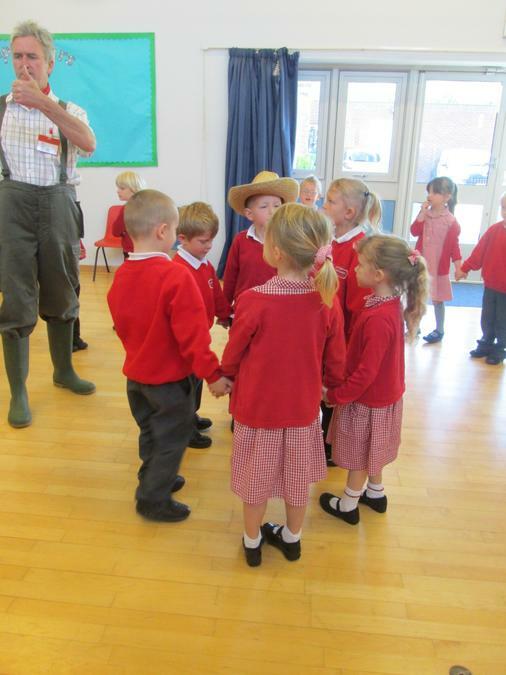 This week we have been using the story of Farmer Duck that we have learnt and we have been acting it out. 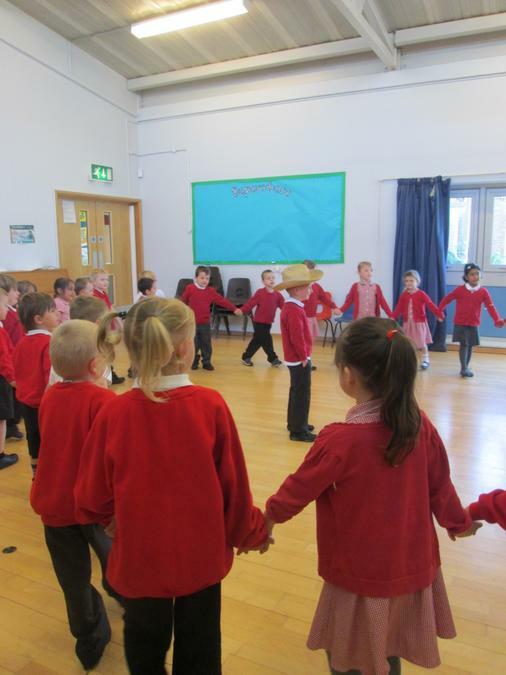 We firstly did this in groups to practice with an adult and now the children have introduced the storyline into their own play creating their own characters and ideas. 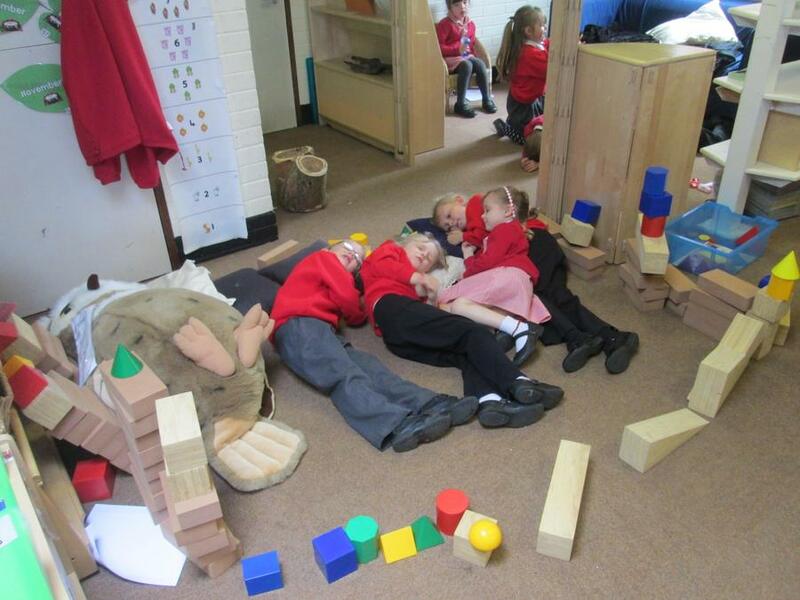 We read the story 'A squash and A Squeeze' the children enjoyed creating different houses from this story. 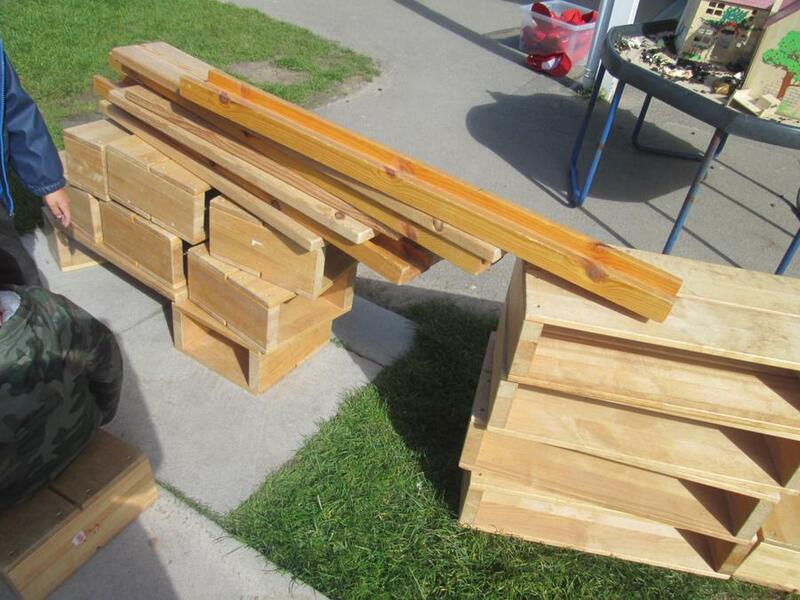 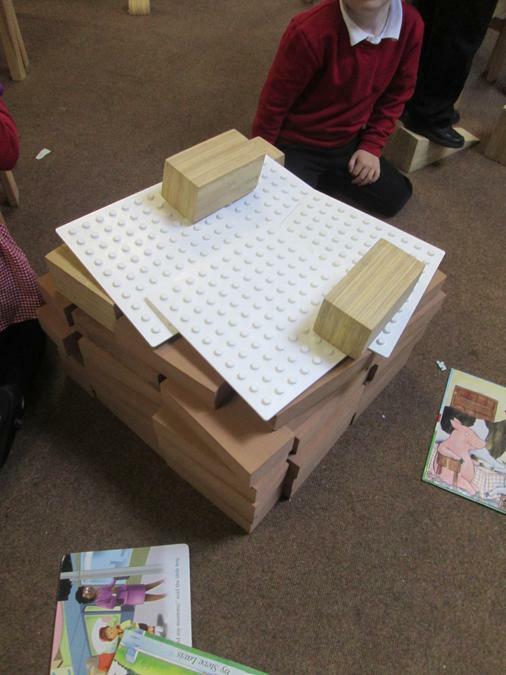 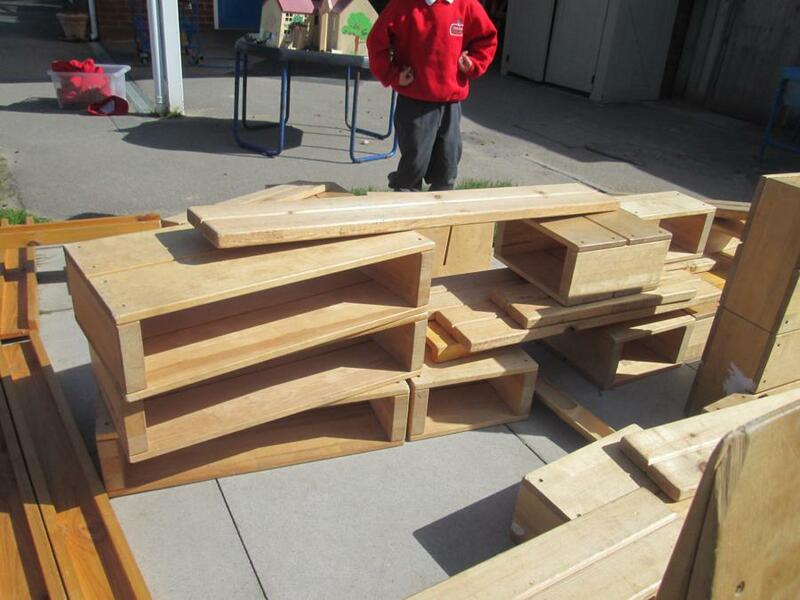 They created construction models in all different shapes and sizes and for different functions. 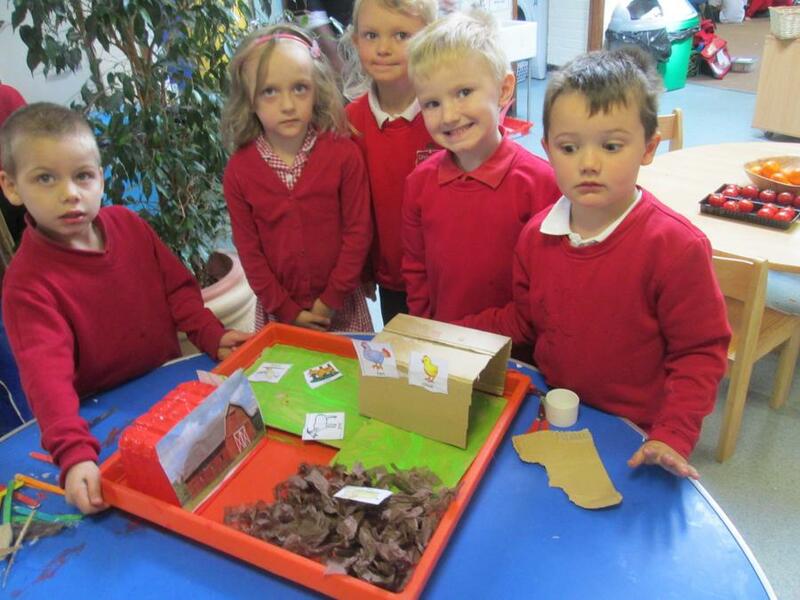 Some children chose to create the farm house in the story and put all the animals inside of it and other children chose to recreate their own versions by creating a palace for the setting. 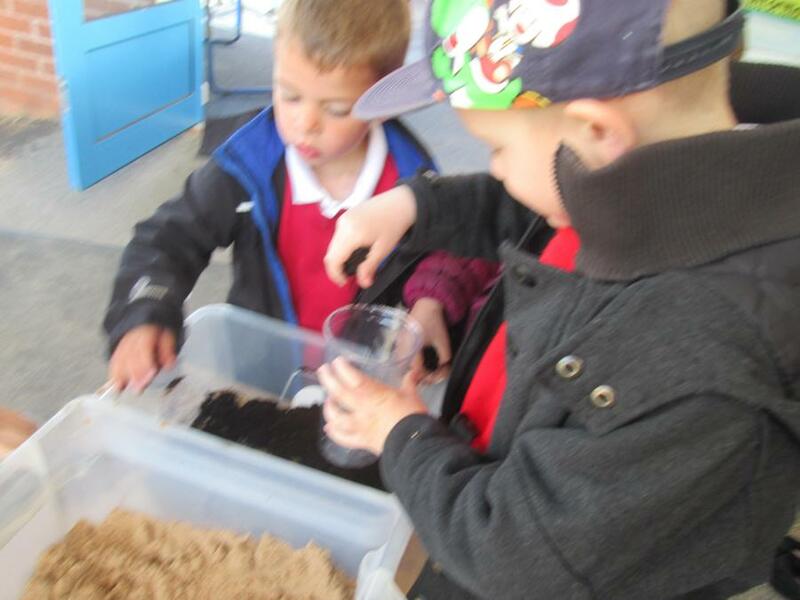 This week we have learnt all about worms. 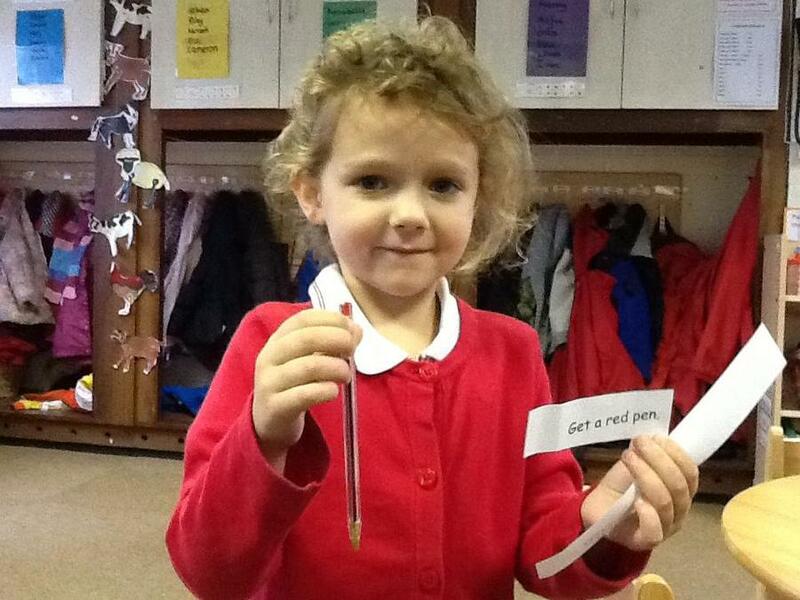 We have read the story 'Superworm' which they really enjoyed and learnt some new worm facts. 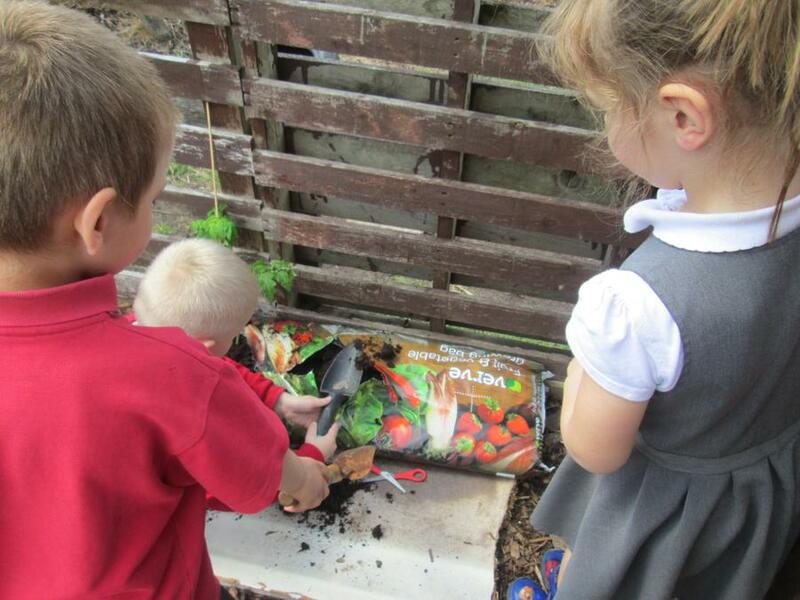 The children then all created their own wormery. 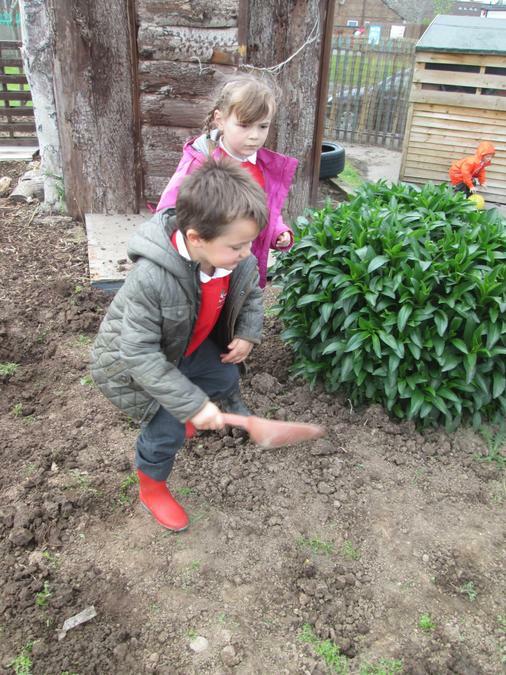 They all found it fun to dance on the soil to make the worms think it is raining and then the children dug for worms to put in their wormery. 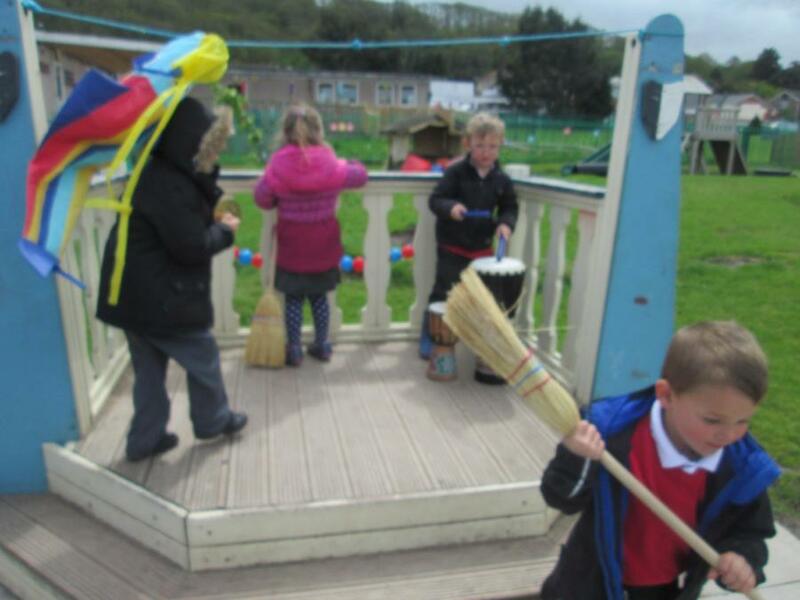 This week we learnt the song 'I am the Music Man' and the children experimented with instruments that could be played in the song. 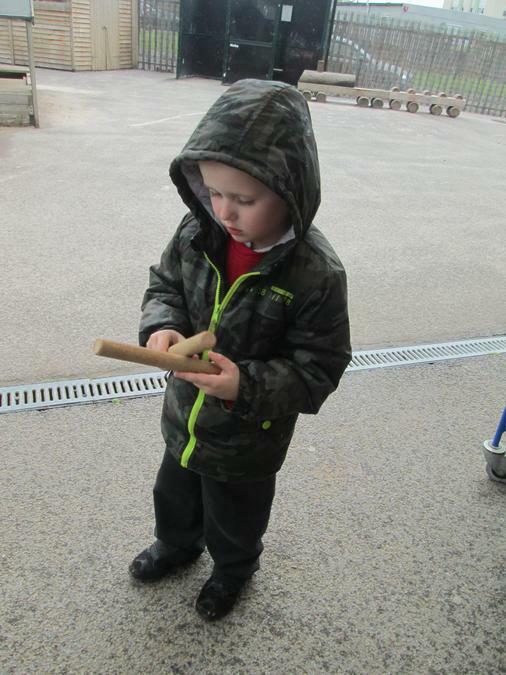 They made their own lyrics and enjoyed using the instruments to discover the different sounds they could make. 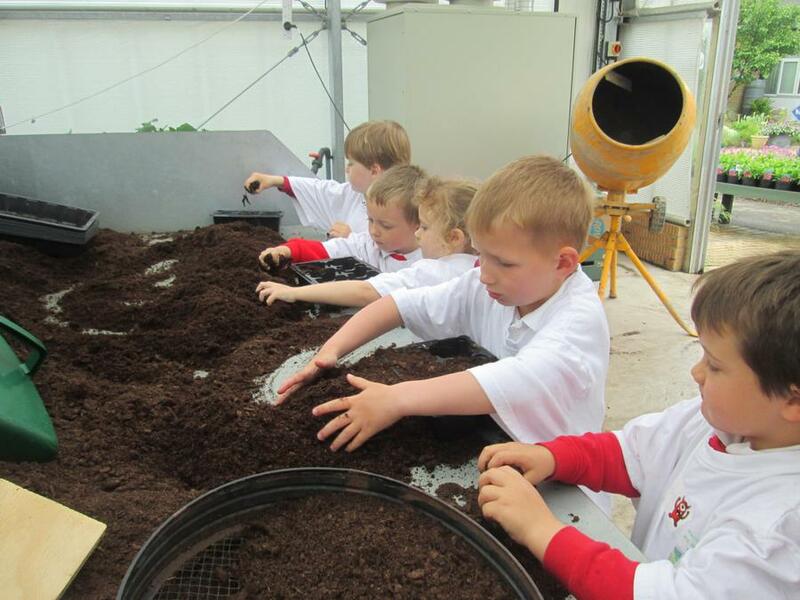 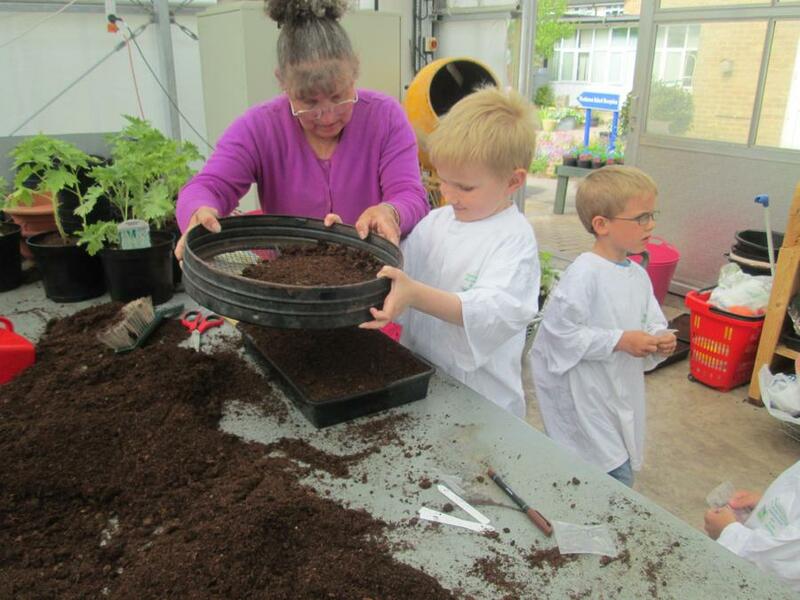 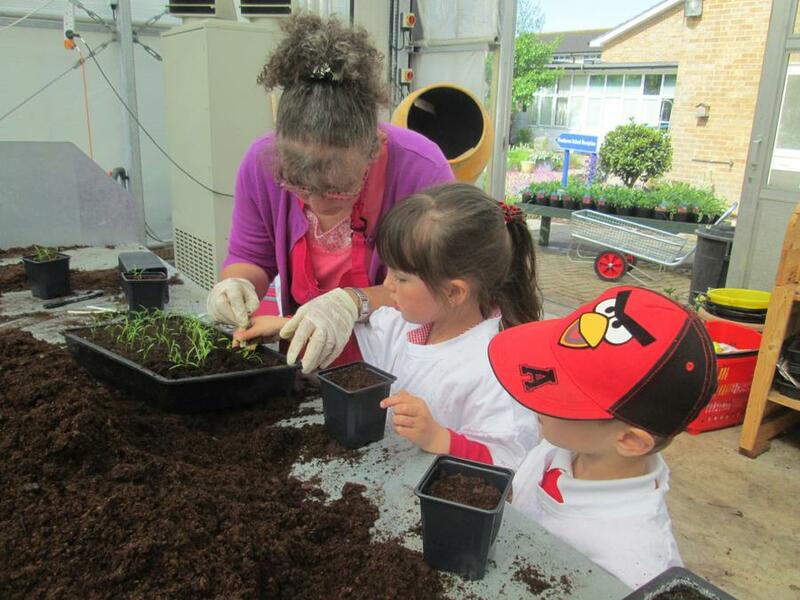 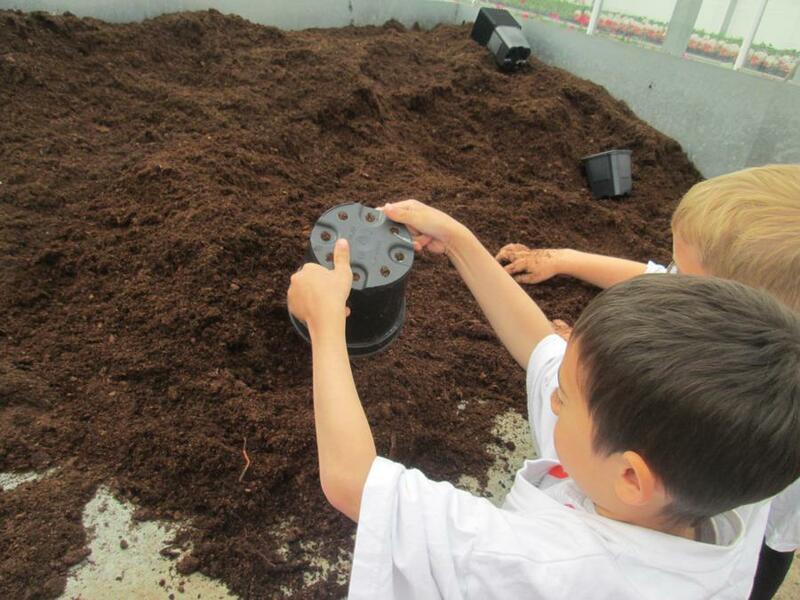 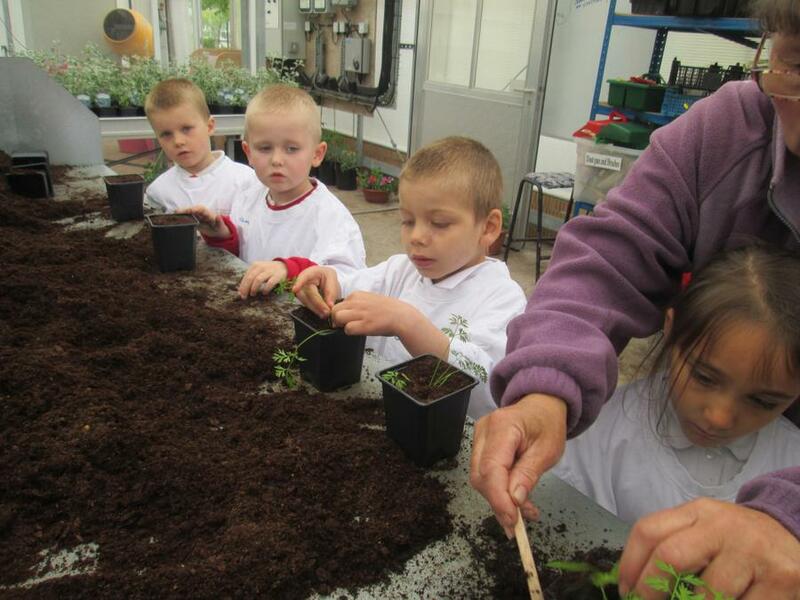 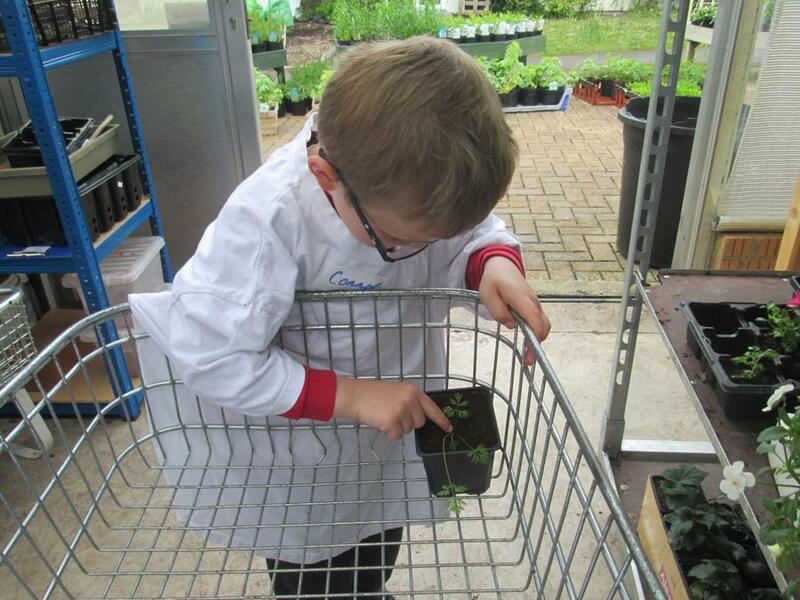 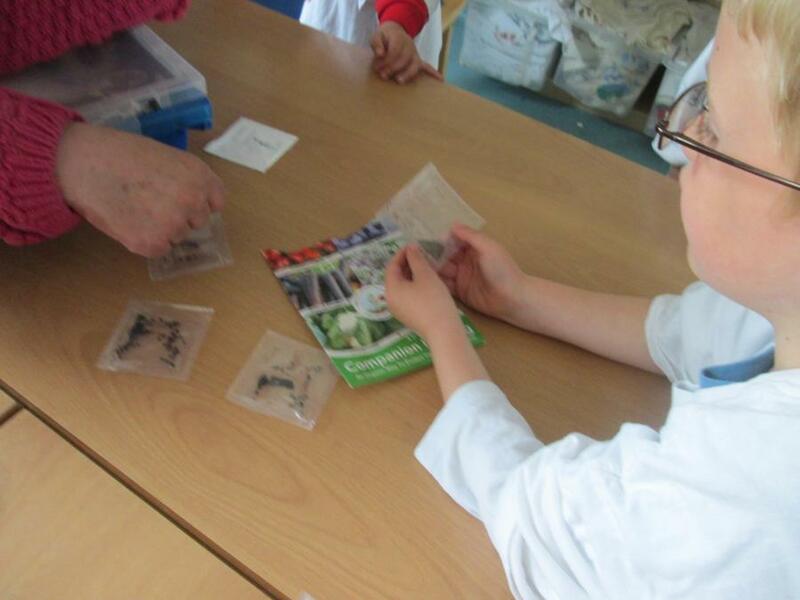 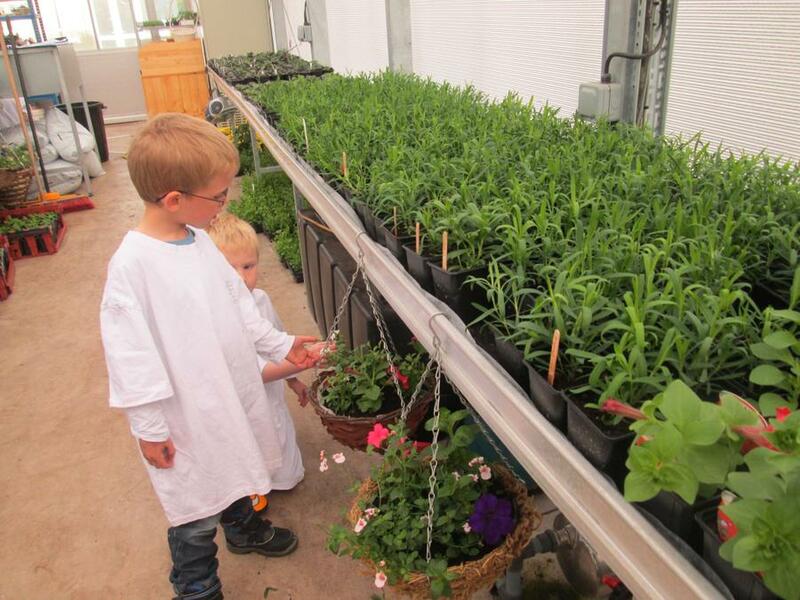 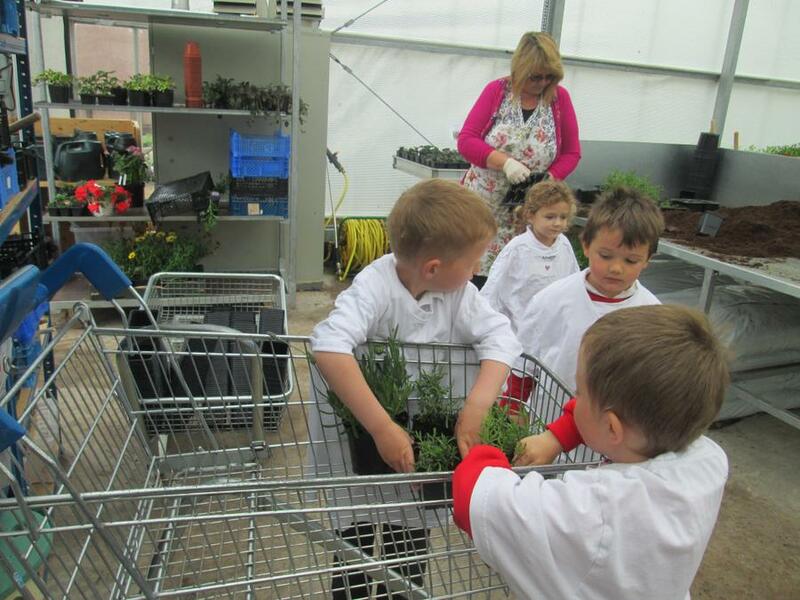 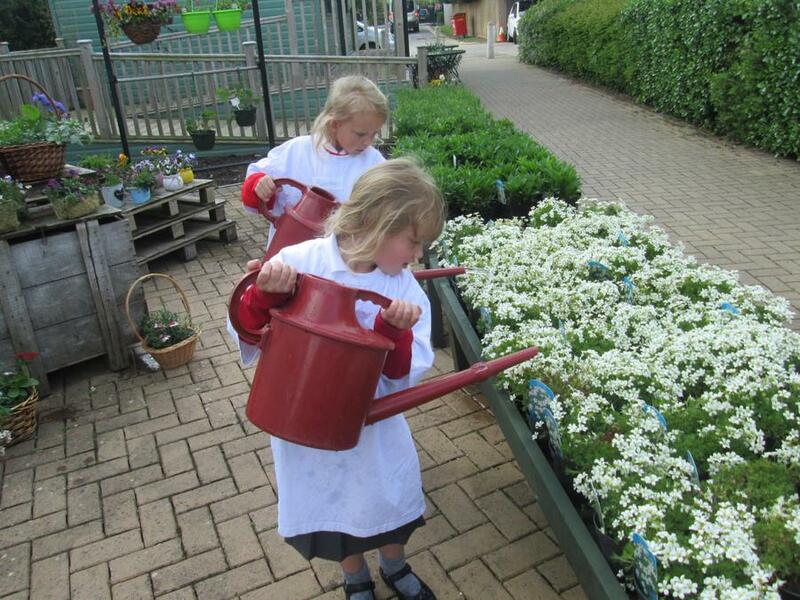 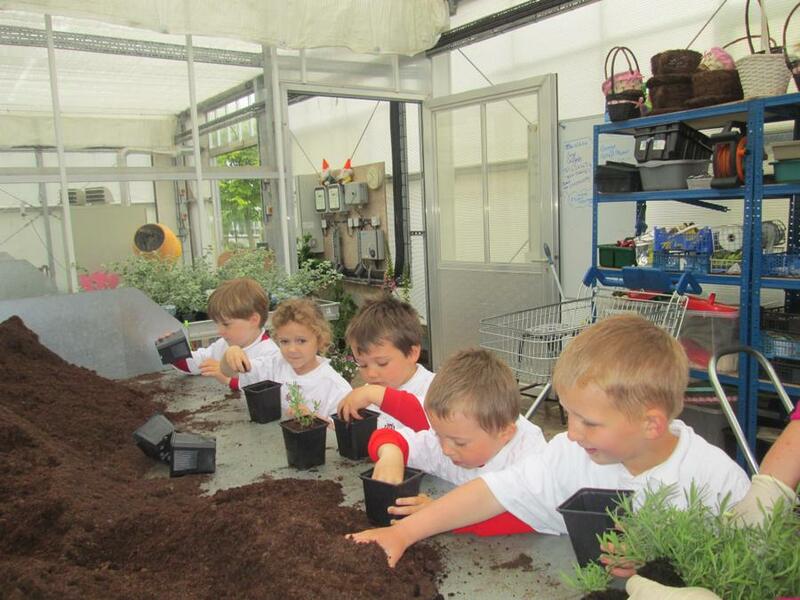 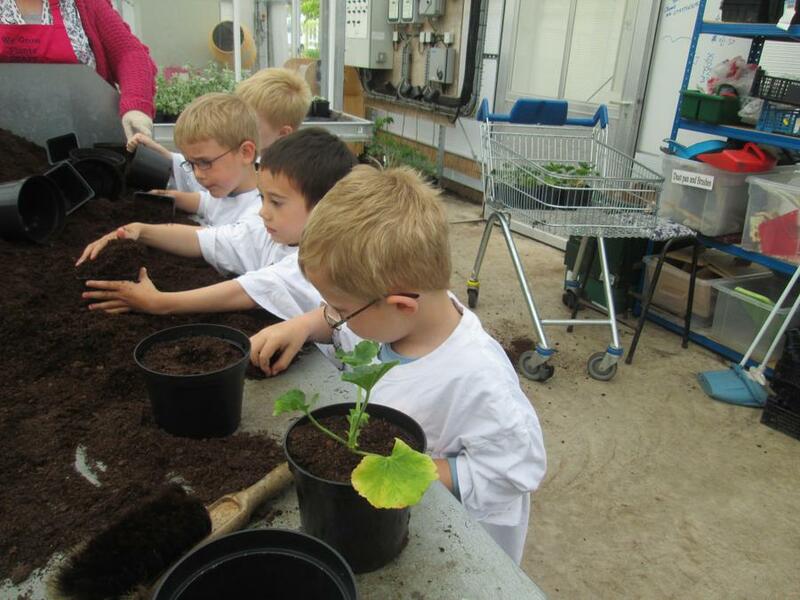 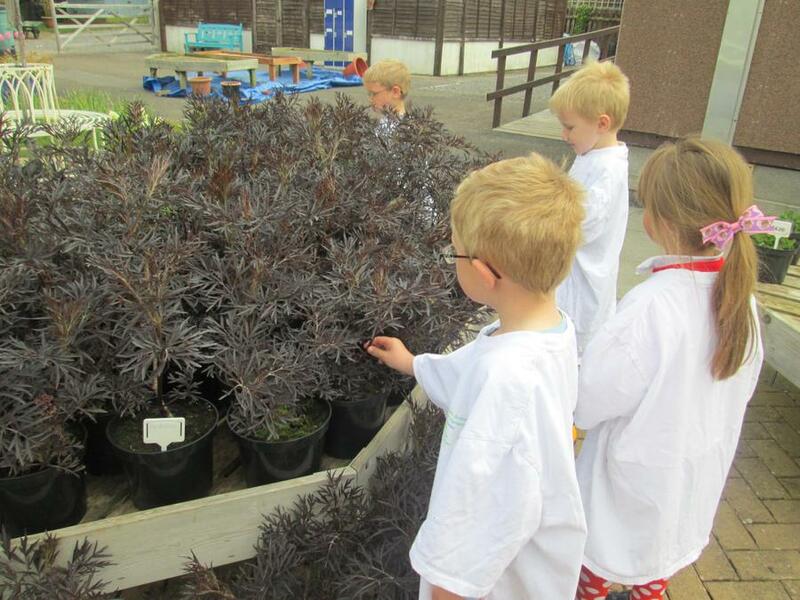 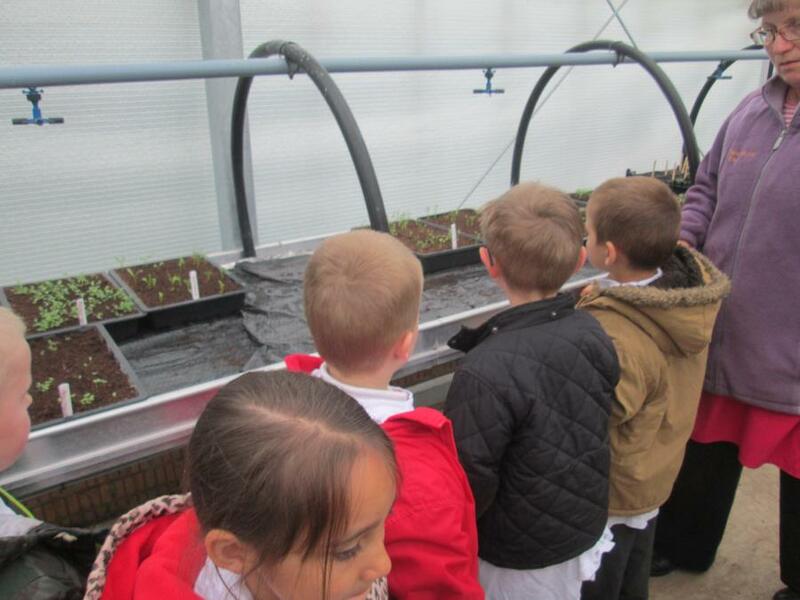 Another group went to Westhaven this week and enjoyed learning all about plants and growing things. 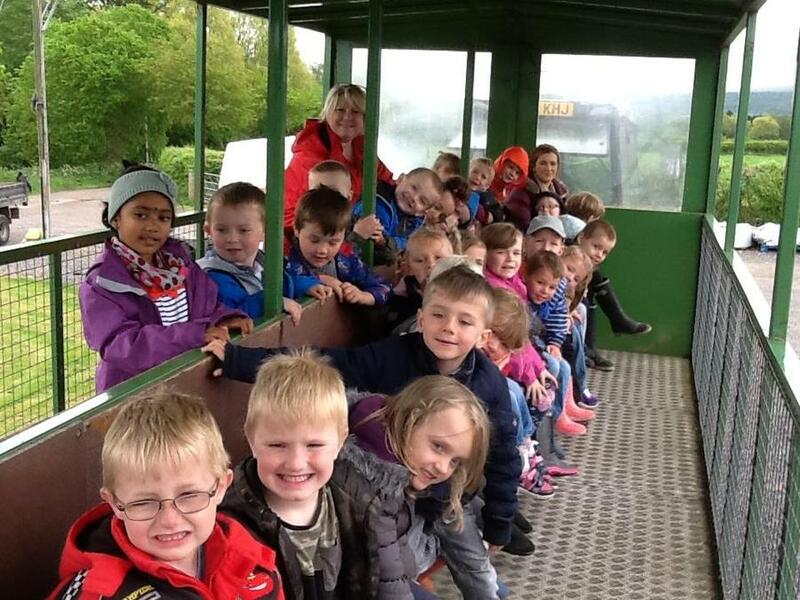 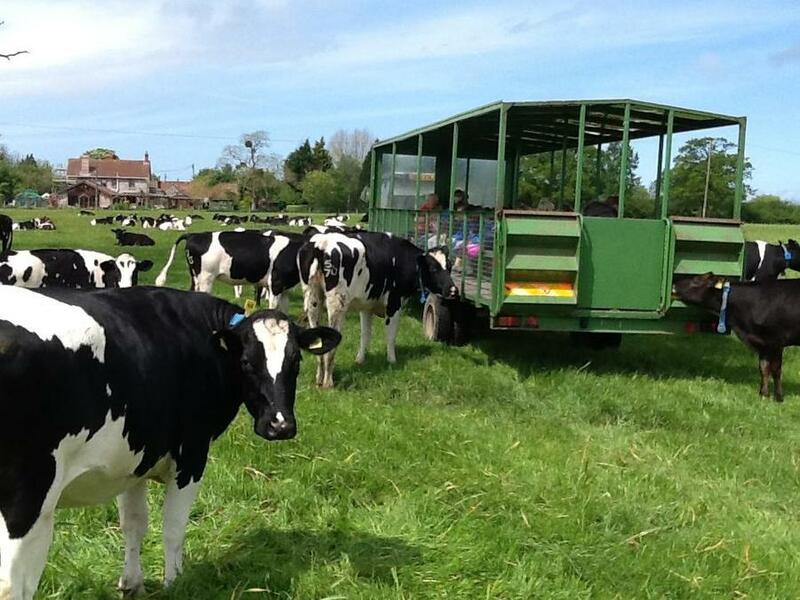 We had a great start to the week by going to Farmer Nick's Farm in Wrington. 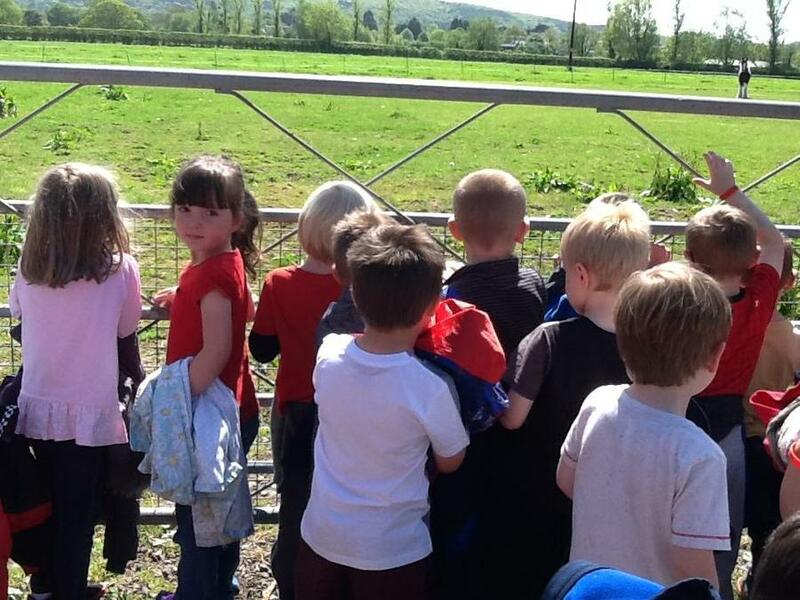 The children got to see a range of farm animals and touch a few of them. 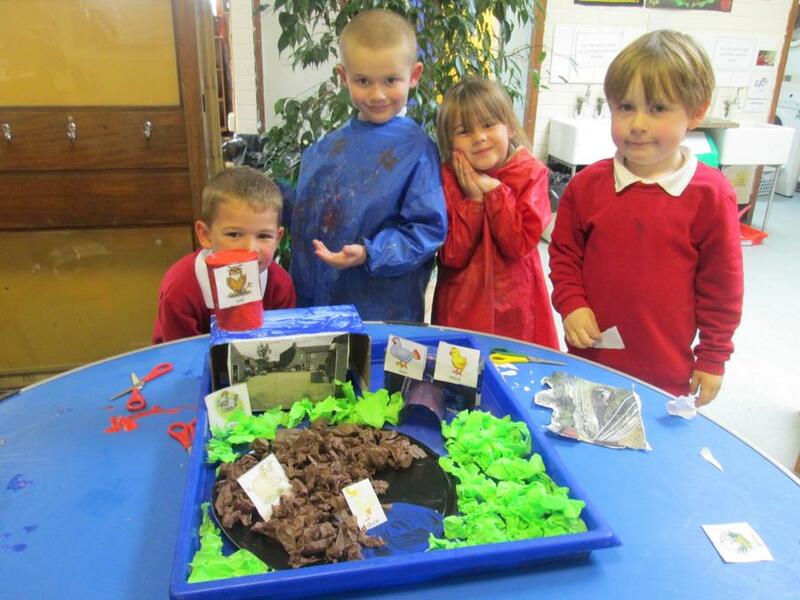 We focused on different habitats and looking what animals live in these places. 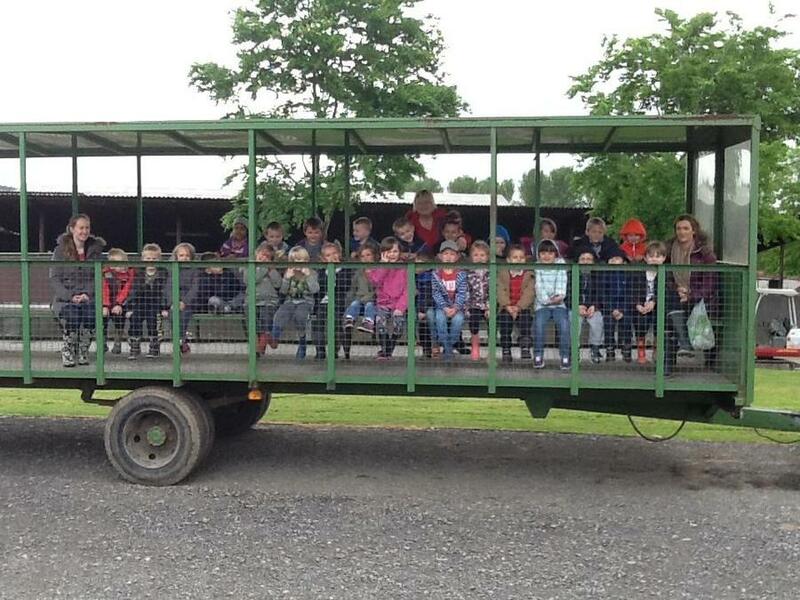 We went on a tractor ride to visit the cows in their field and the children got to ask Farmer Nick any questions. 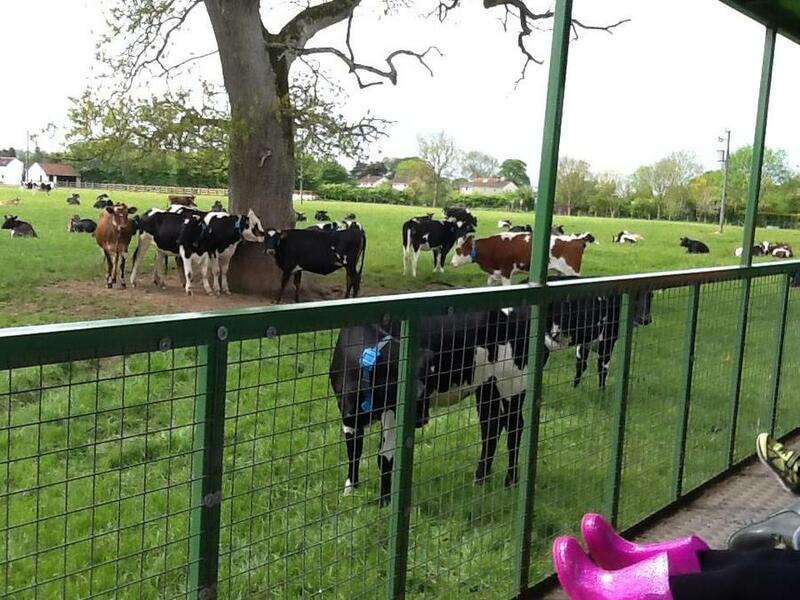 Then we drove through the village and got to see places around the farm. 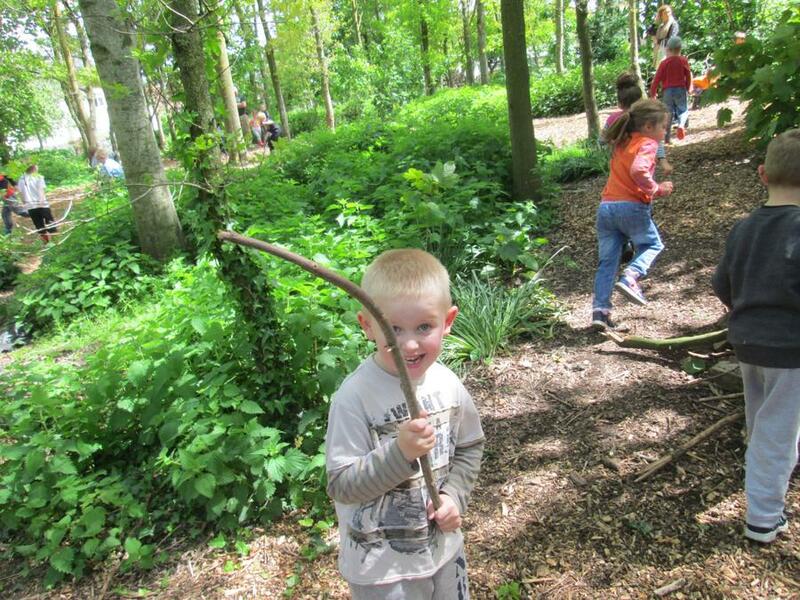 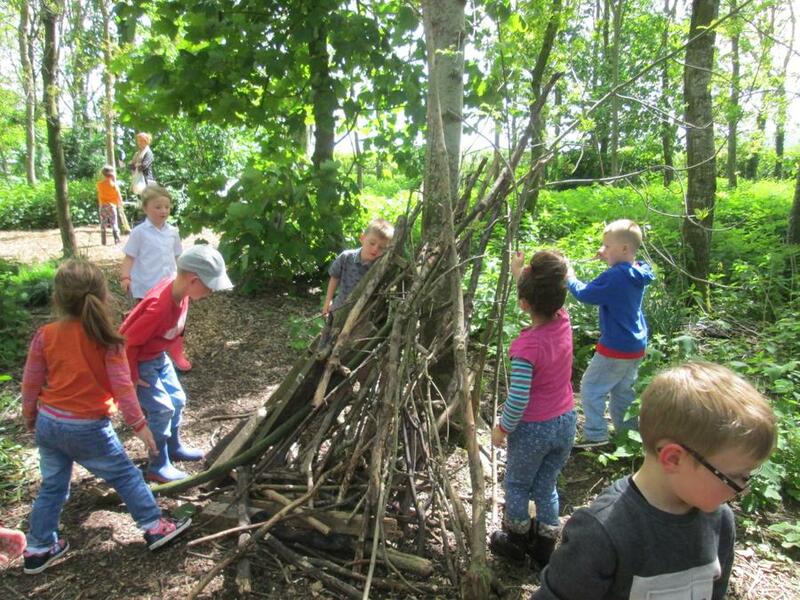 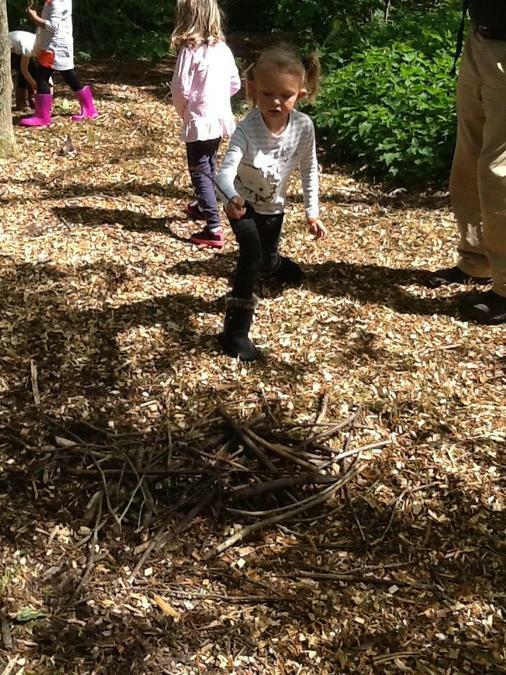 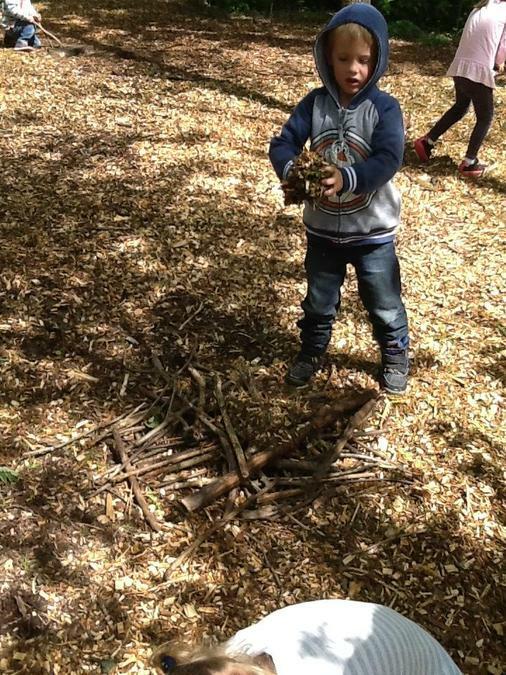 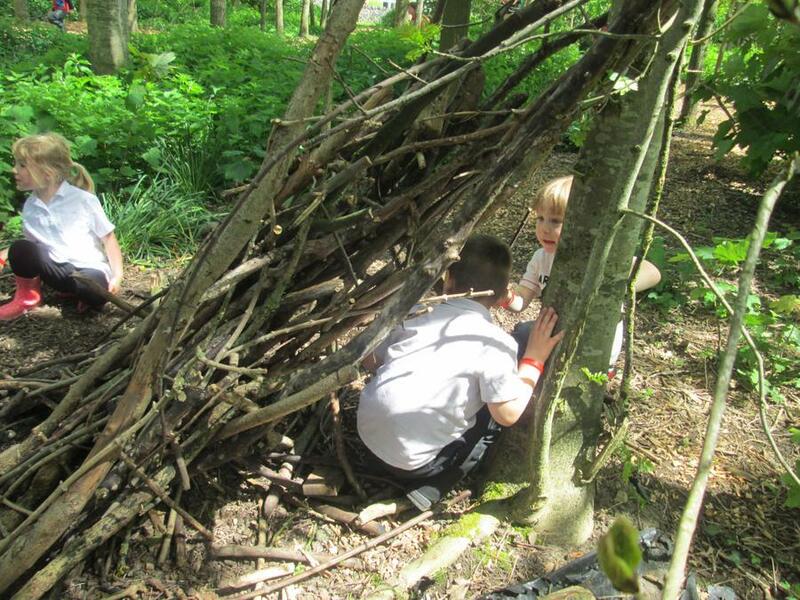 The children got to explore the woods and build from their own ideas with sticks, trees and leaves; they enjoyed making dens and camp fires. 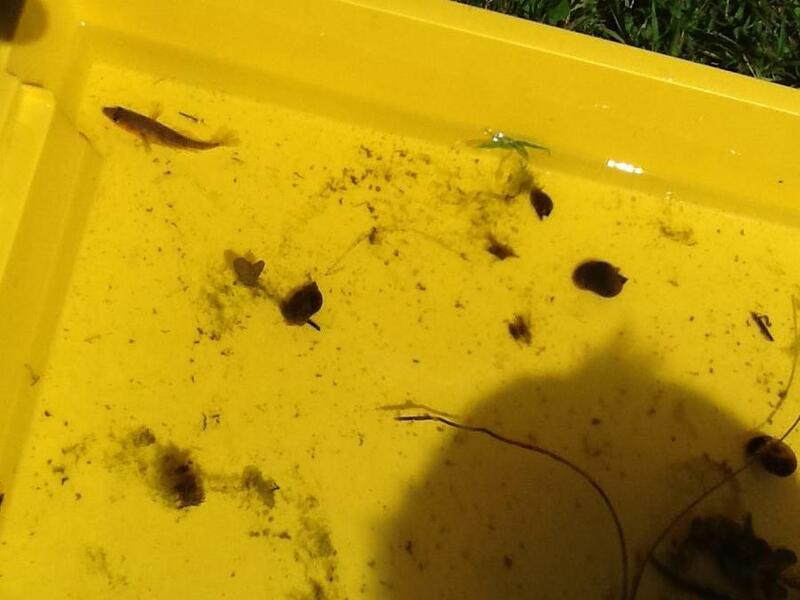 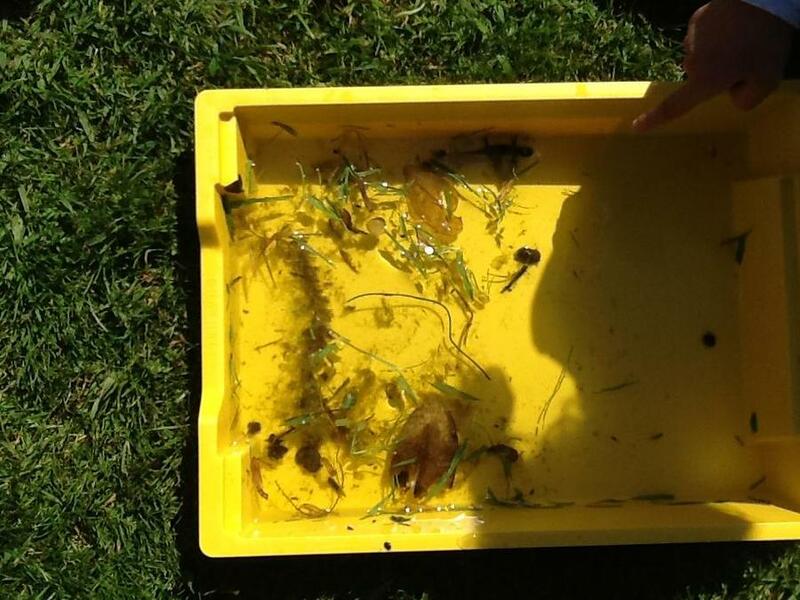 We finished the day off with pond dipping and exploring what the found in the pond. 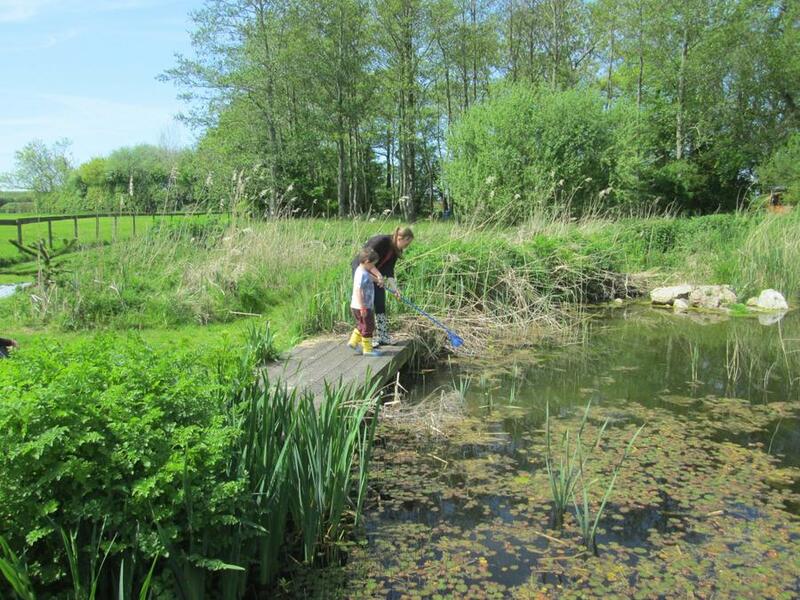 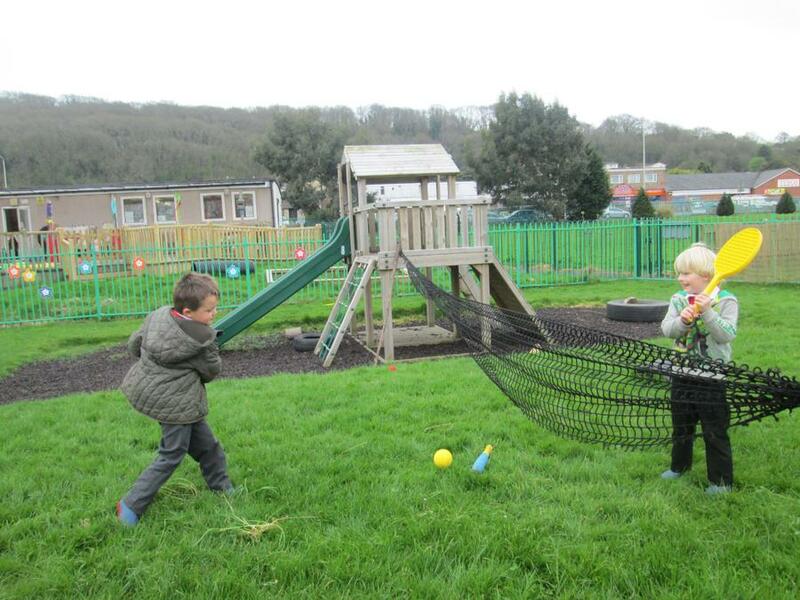 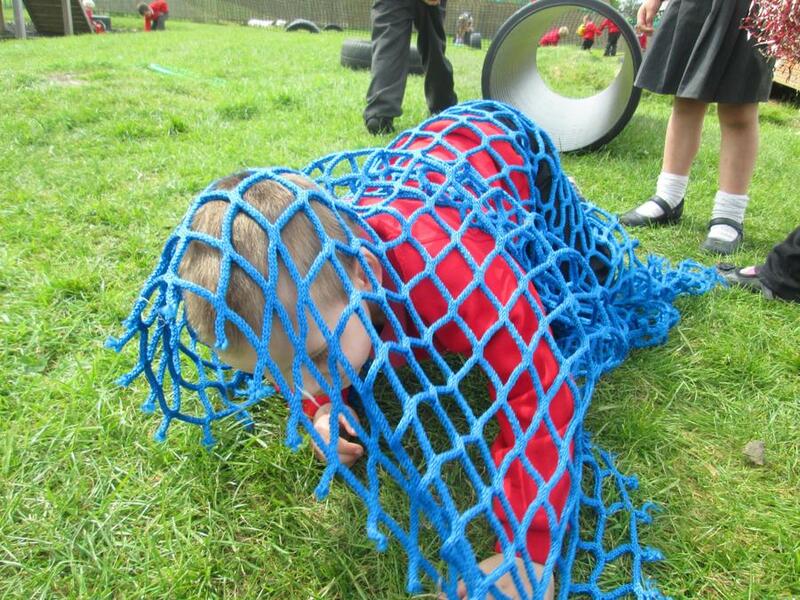 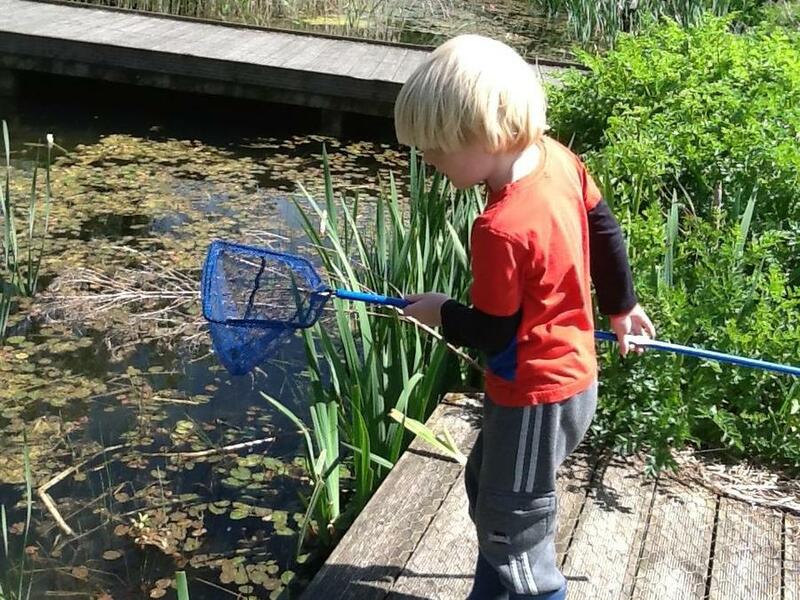 The children used nets to search the pond and explore the habitat. 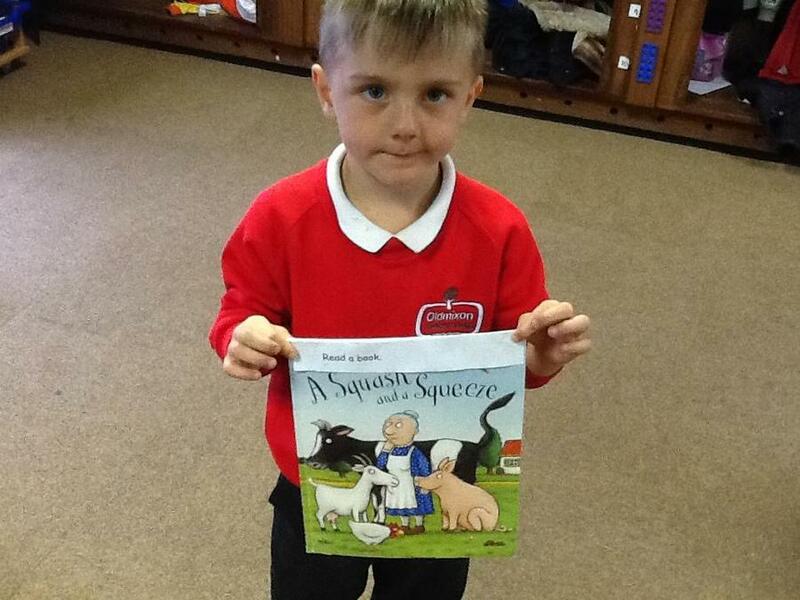 The children have been learning the story of The Three Billy Goats Gruff. 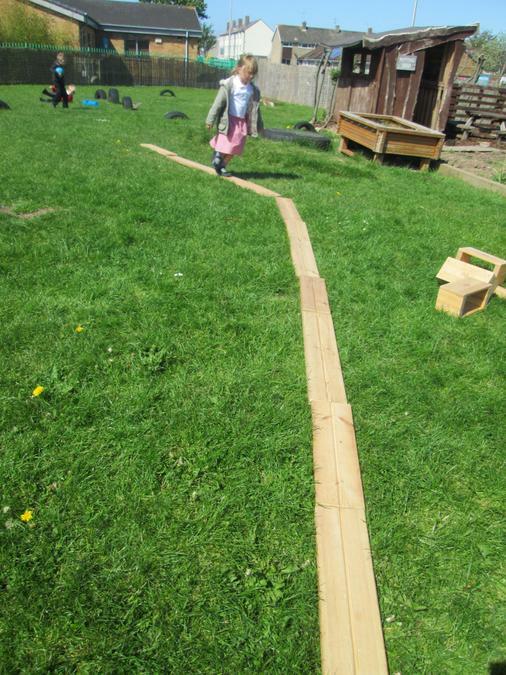 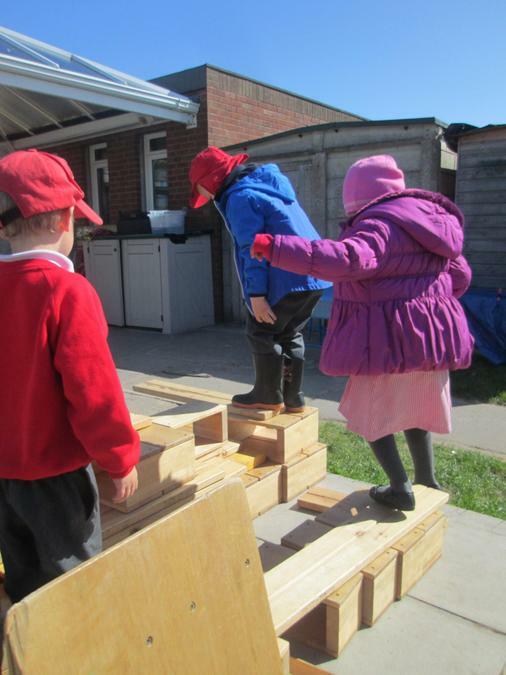 They enjoyed stomping over the bridge at the farm saying 'Who's that trip trapping on my bridge' so when we got back to school we made our own bridges out of building blocks and wood. 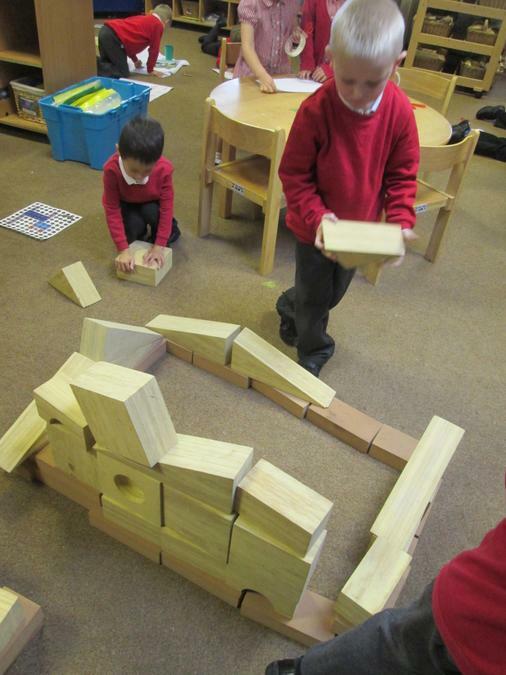 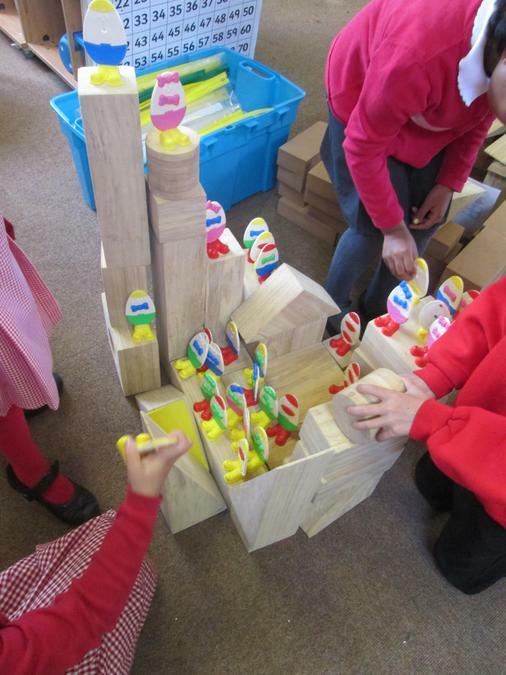 The children then used their bridges to re-create the story. 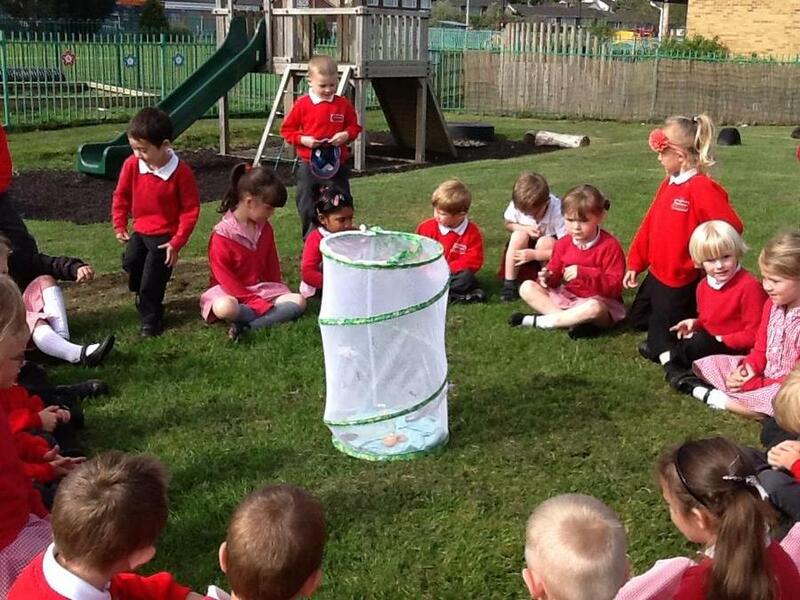 This week our butterflies were ready to leave us. 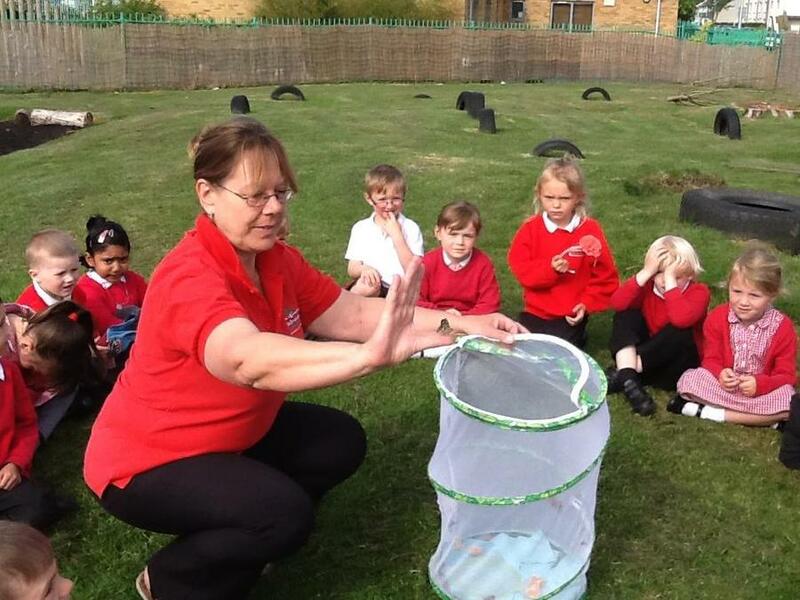 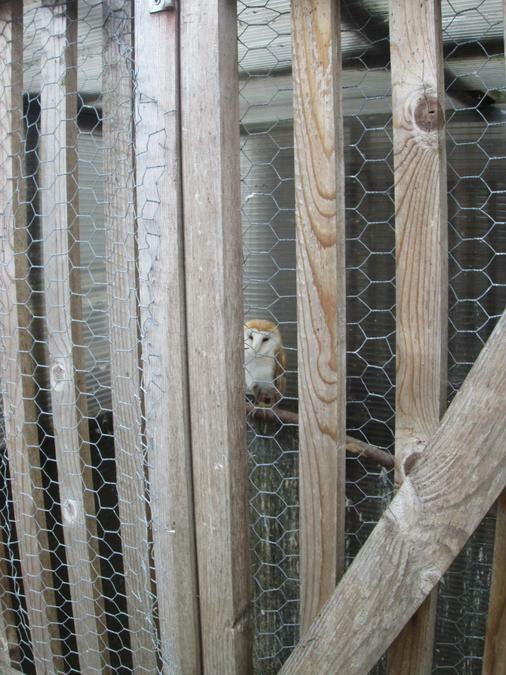 We all went outside and opened their net, the children said goodbye and watched them fly away. 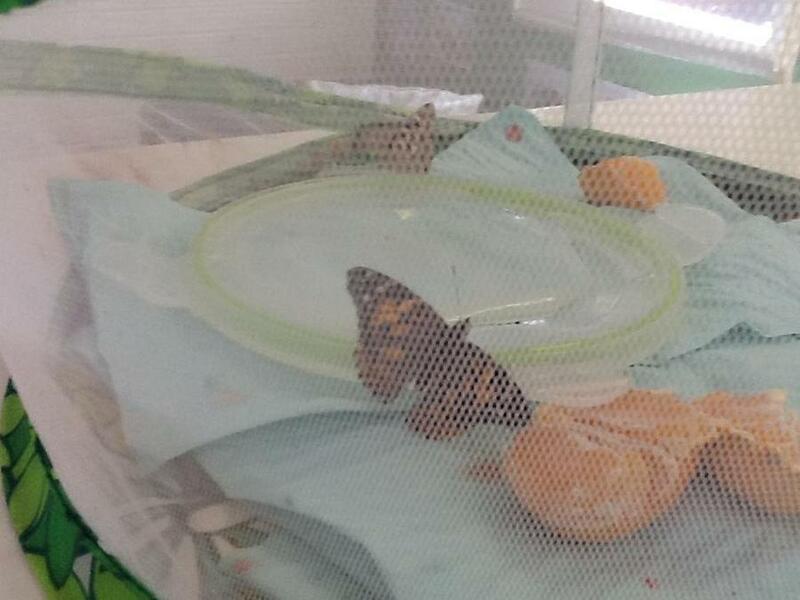 One butterfly stayed on our hut for a while and the children liked him staying to visit us. 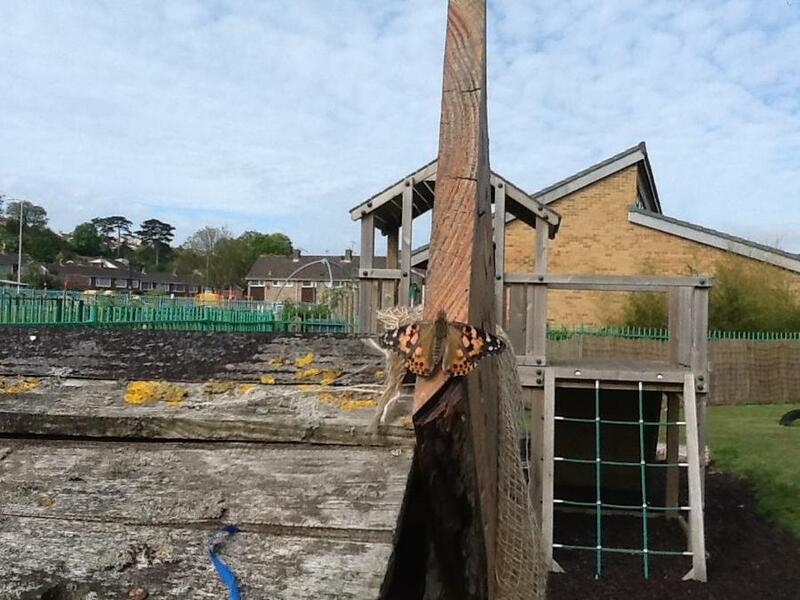 The children have been watching out for our butterflies to fly back to us during the week. 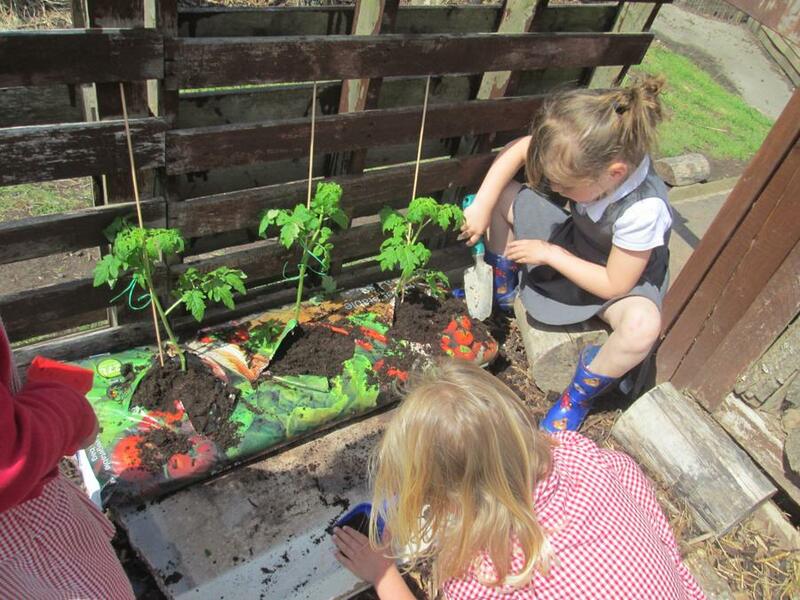 We were given plants from Westhaven last week and this week the children have been planting them to improve our garden. 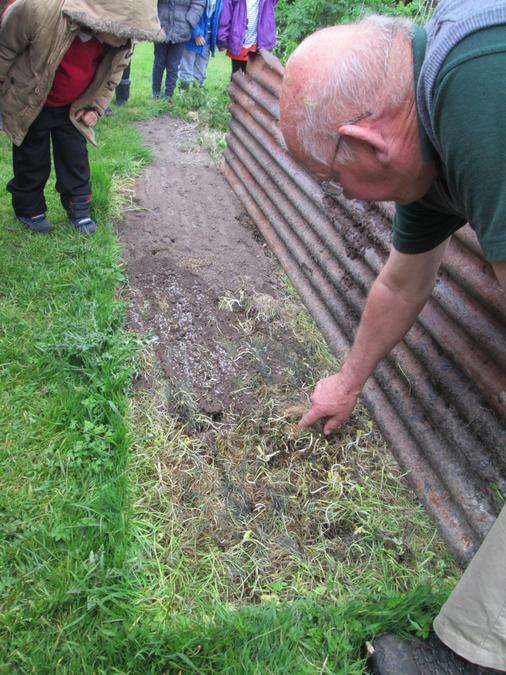 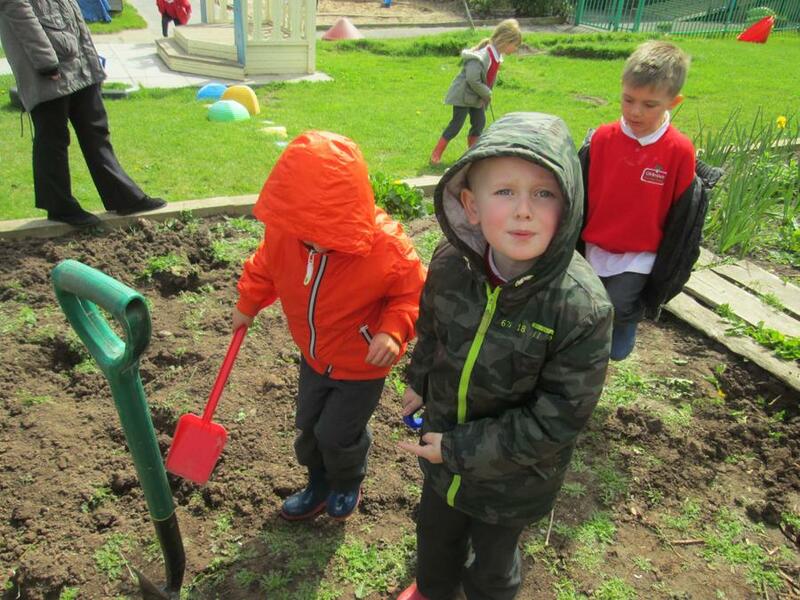 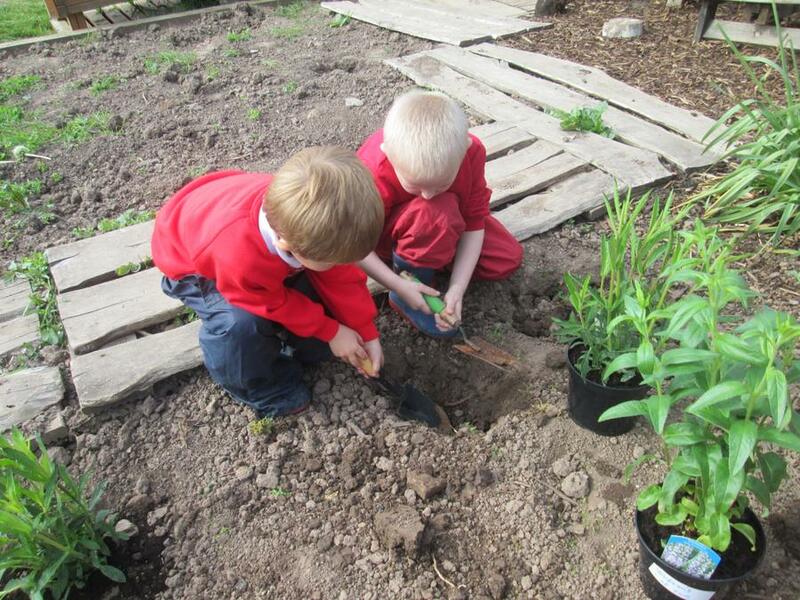 The children have dug the holes and planted the plants and potatoes on their own. 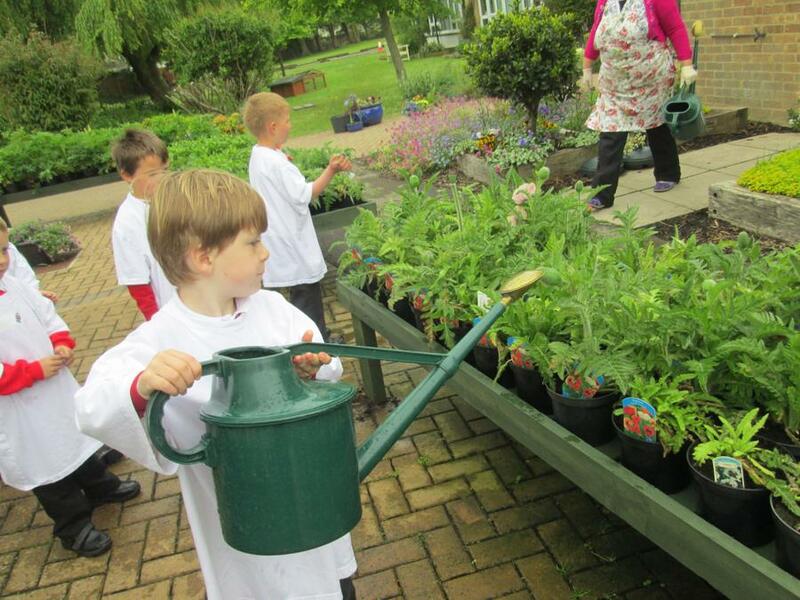 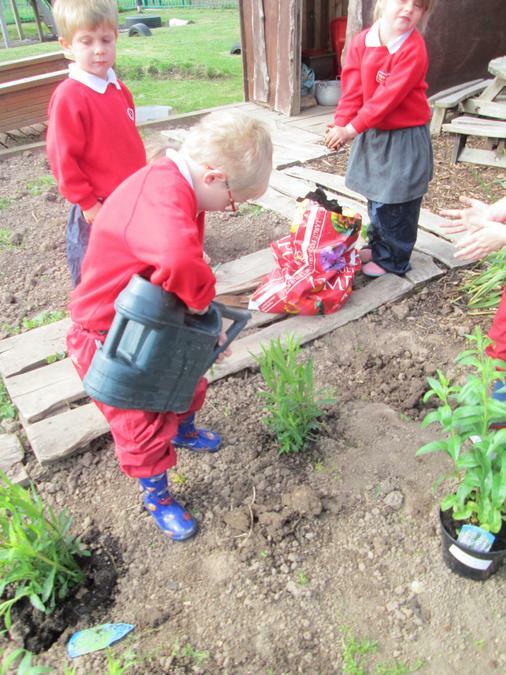 The children have learnt that plants need to water to grow and they have caring for them. 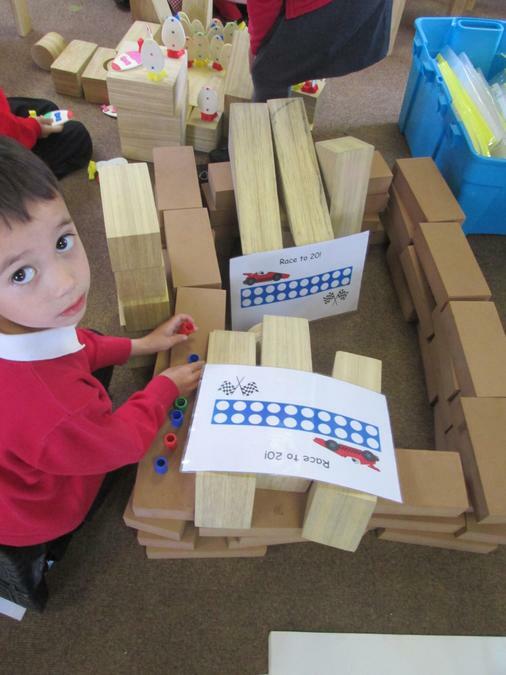 We have been looking at instructions this week; the children have read the instruction and then shown they have understood by following what it says. 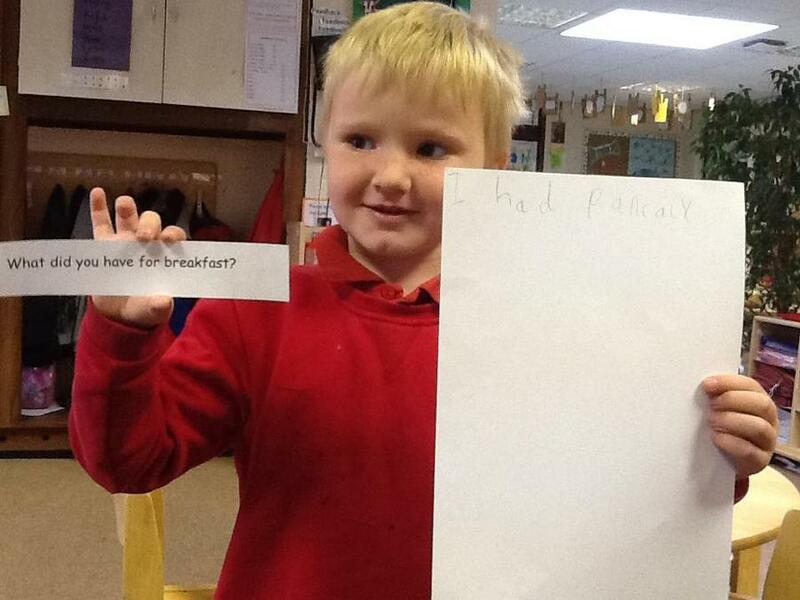 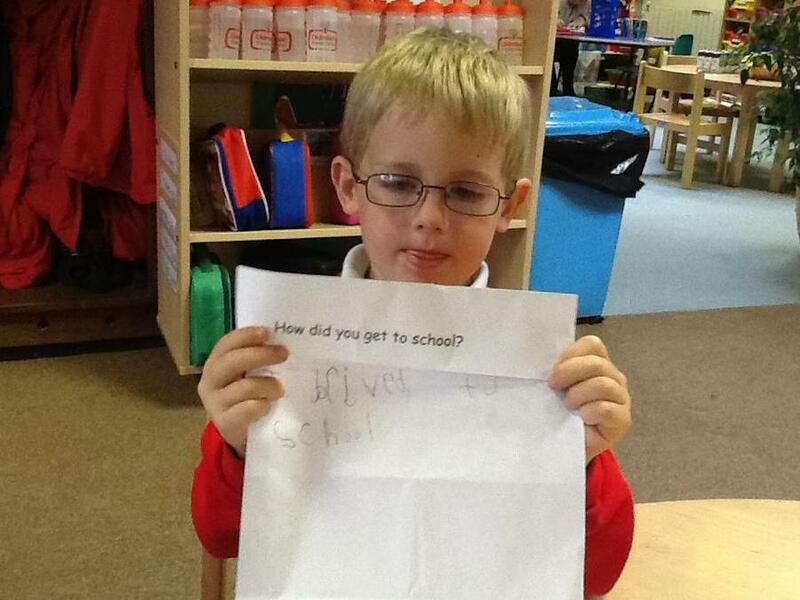 The children have also been left questions in their draws which they have read and responded to. 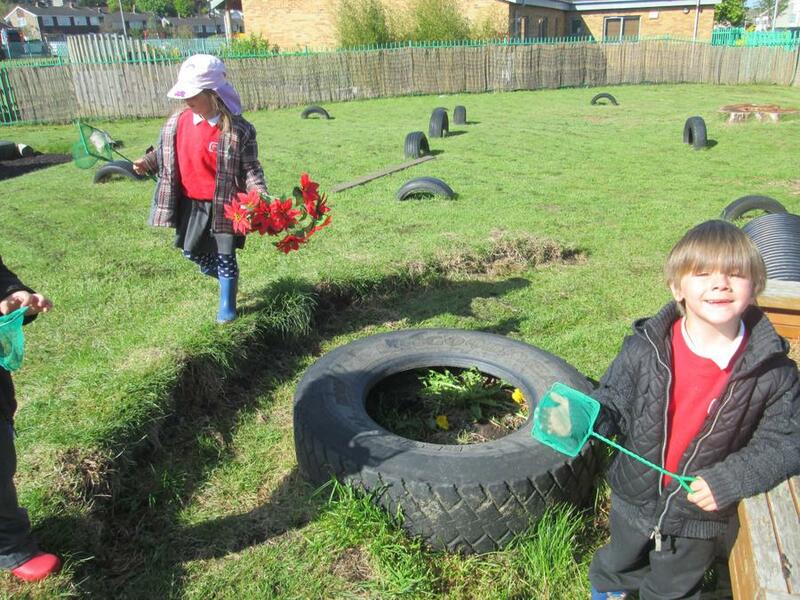 We have come to the end of our Farm topic and the children have had a fantastic time. 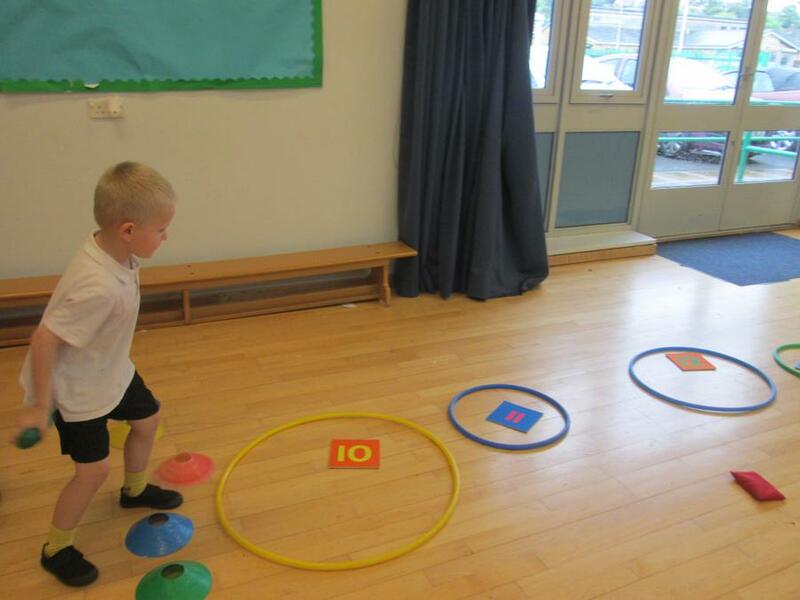 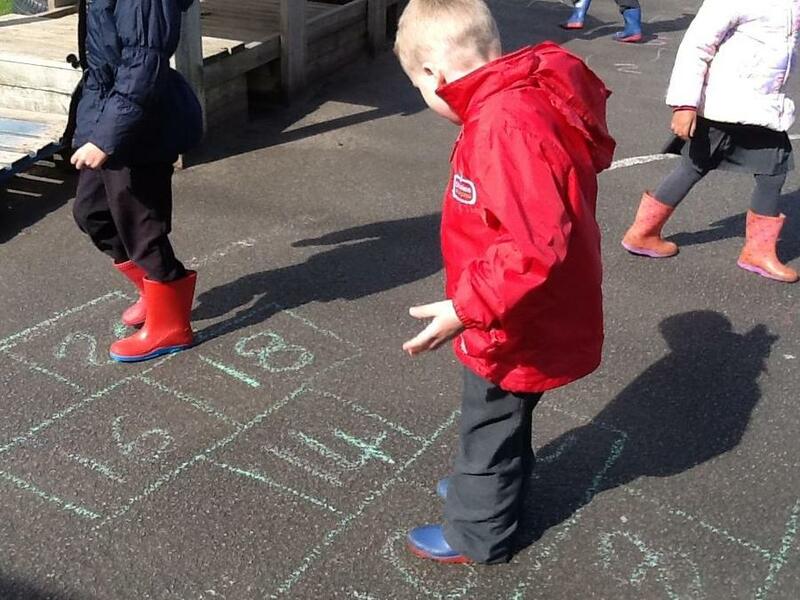 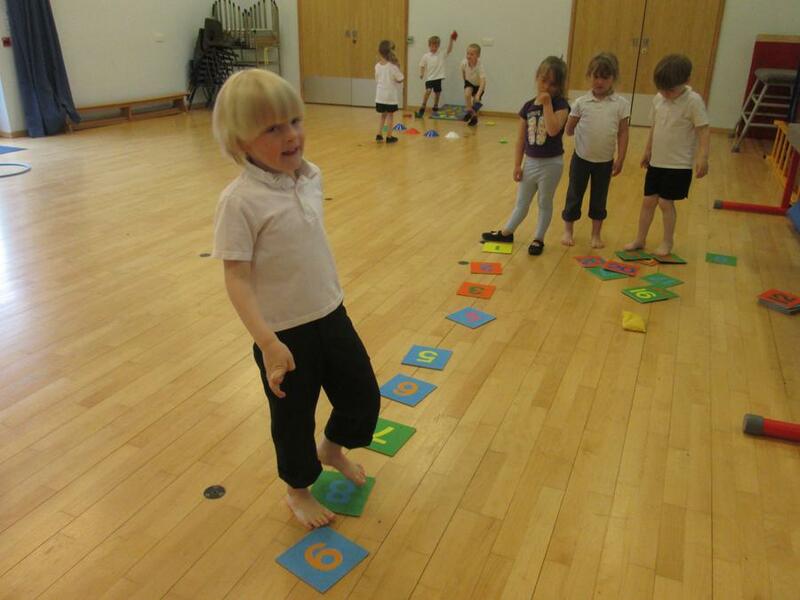 This week we have been practising our numbers 1 - 20 in different ways this has involved number tiles, number games and hopscotch. 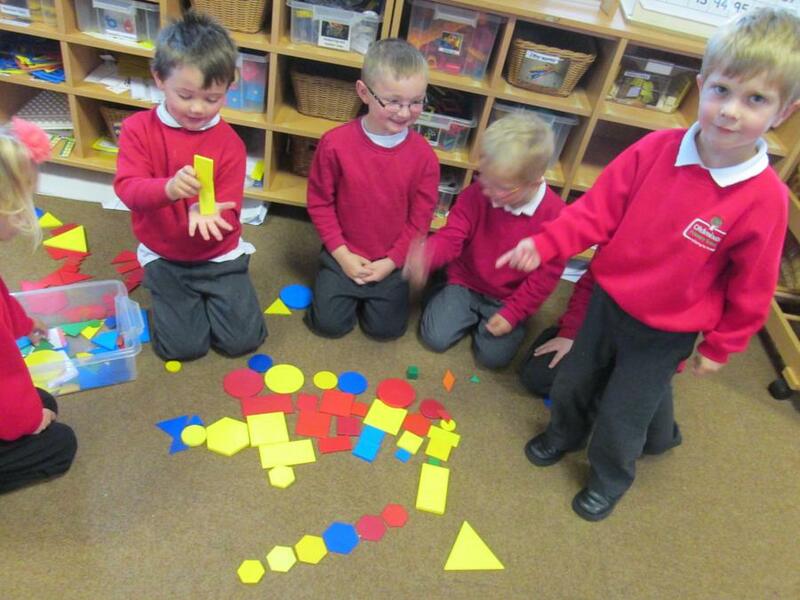 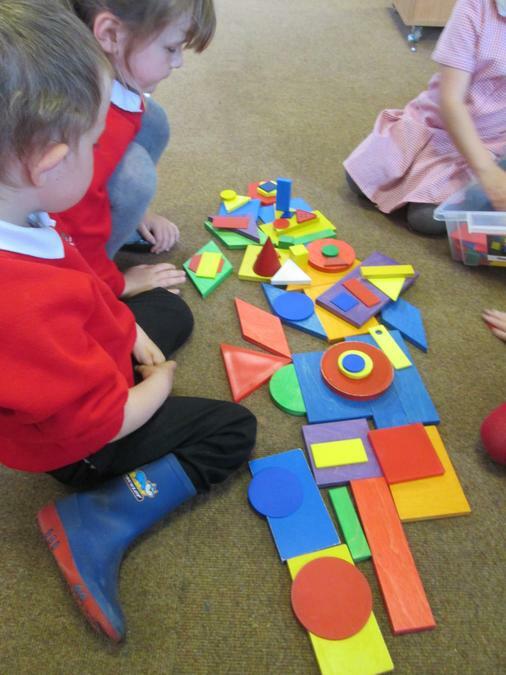 This week we have been revising our shape knowledge and using our shapes to create patterns and pictures. 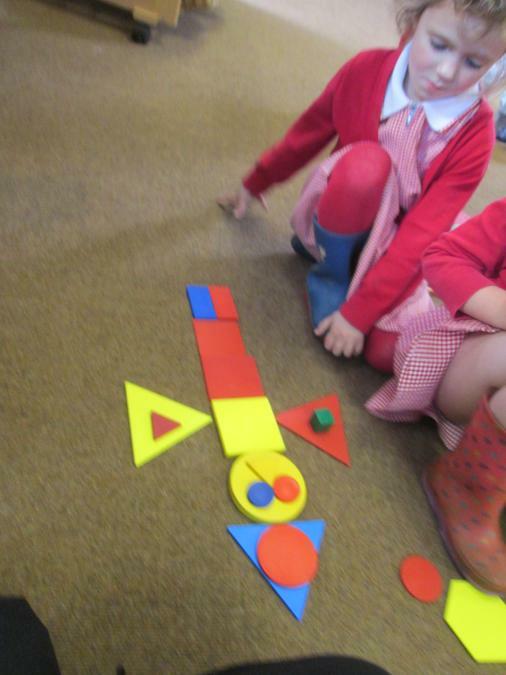 Once the children had created their pictures they named all the shapes they had used. 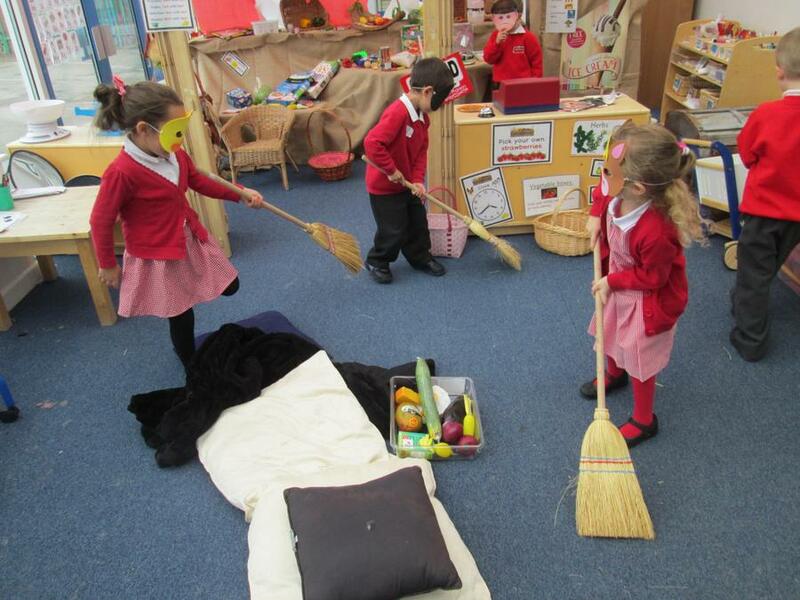 In Reception we are working towards building narratives into our play and creating story lines. 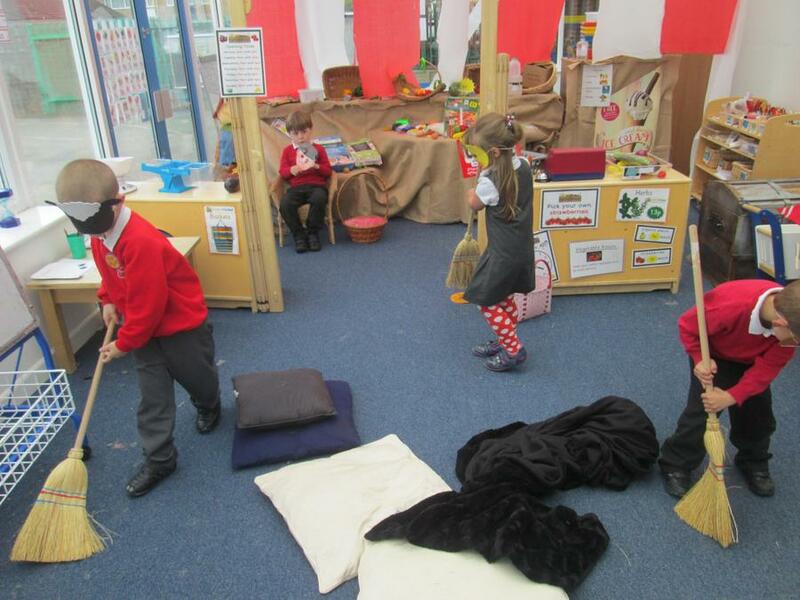 We have been learning the story of Jack and the Beanstalk. 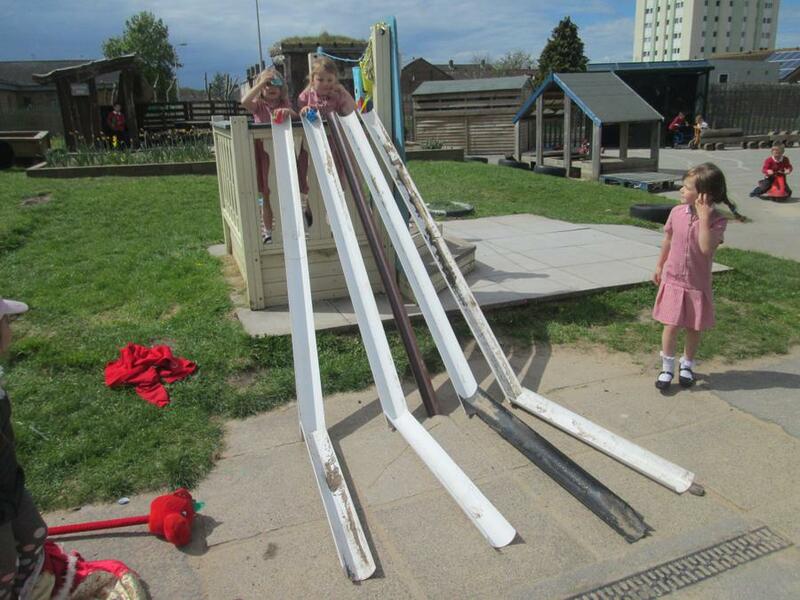 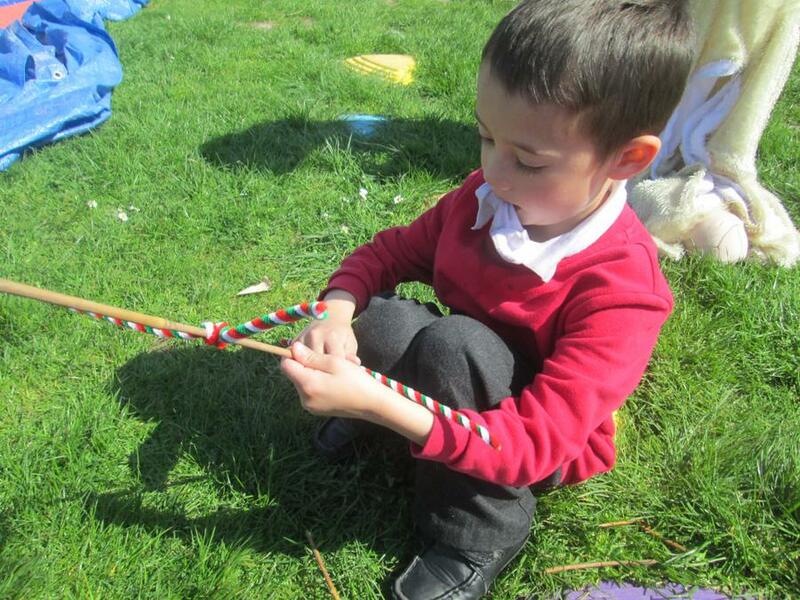 Some children used the story to act out the characters or create a beanstalk outside with different materials. 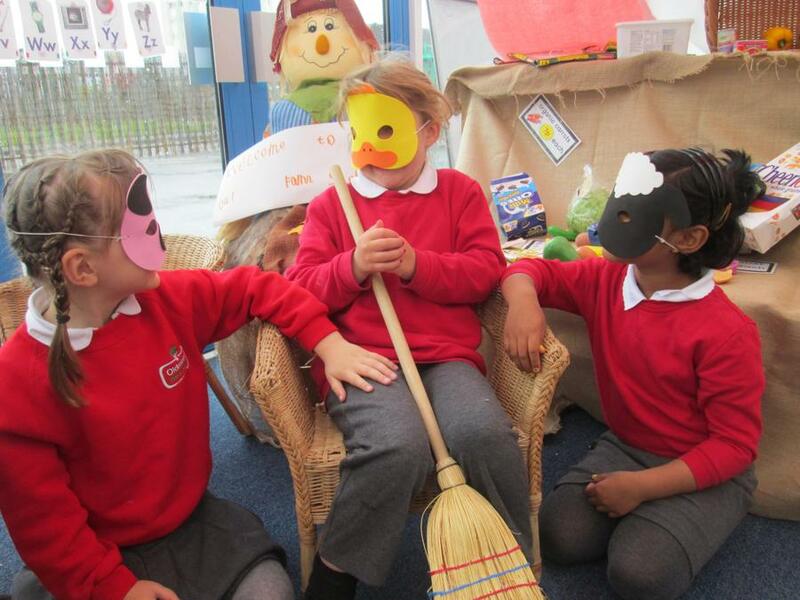 Other children used the story to create their own shows or adapt the story by adding new characters and twists. 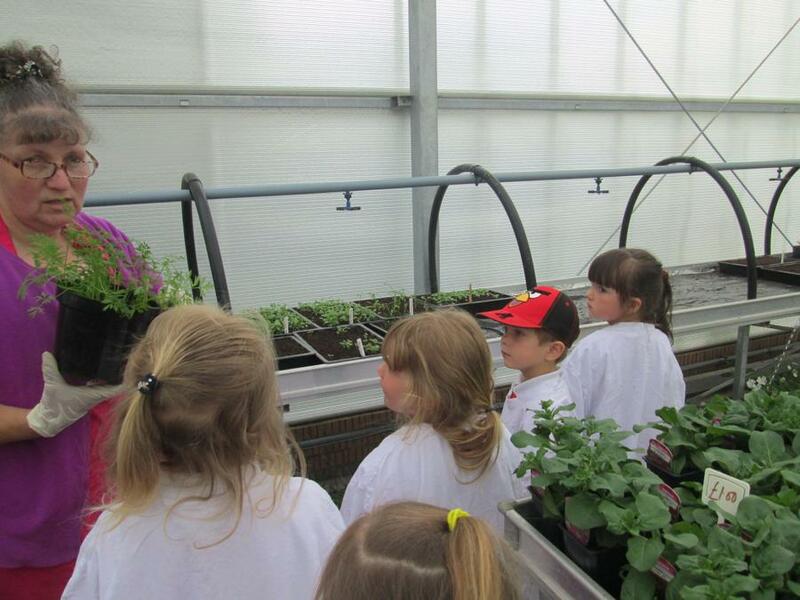 Here are the photos from two more groups at West haven. 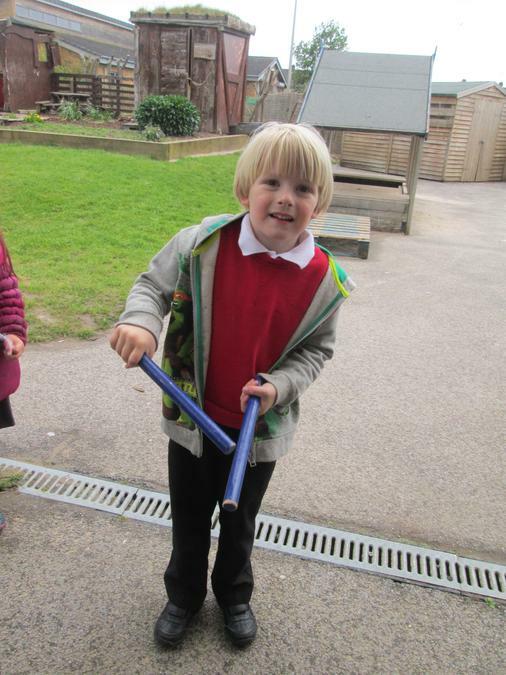 The children would like to share with you their learning and what they experienced. 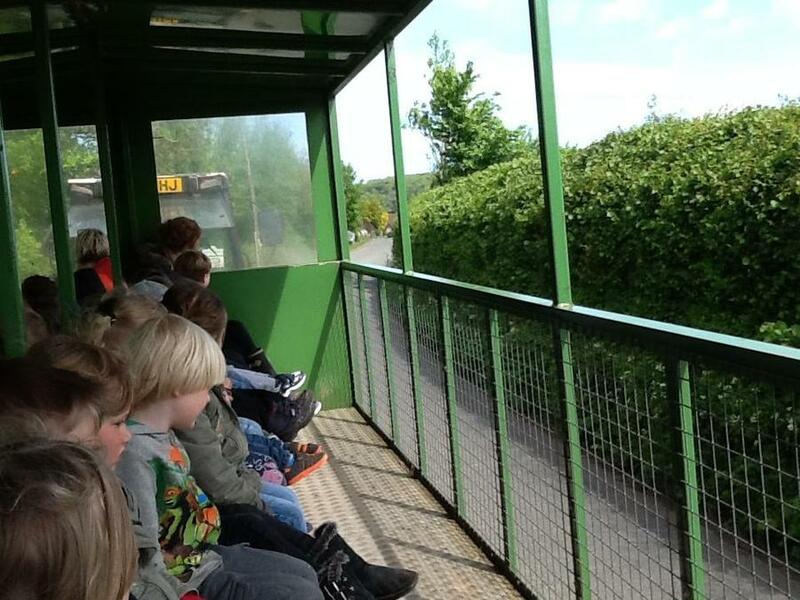 We still have two more groups to go on the trip in the following Term. 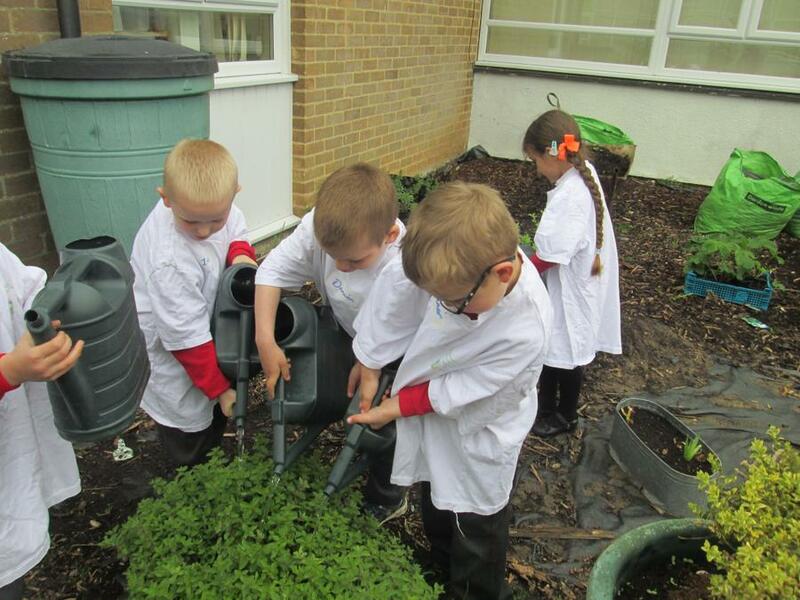 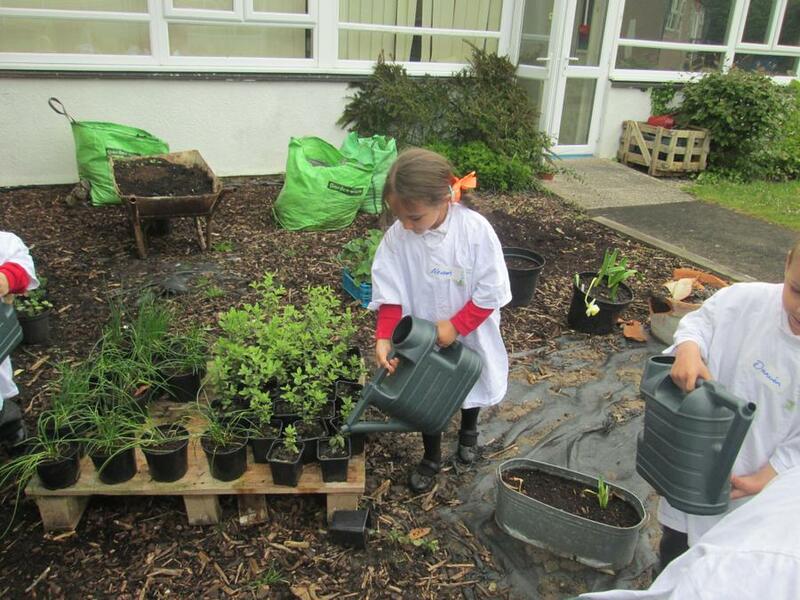 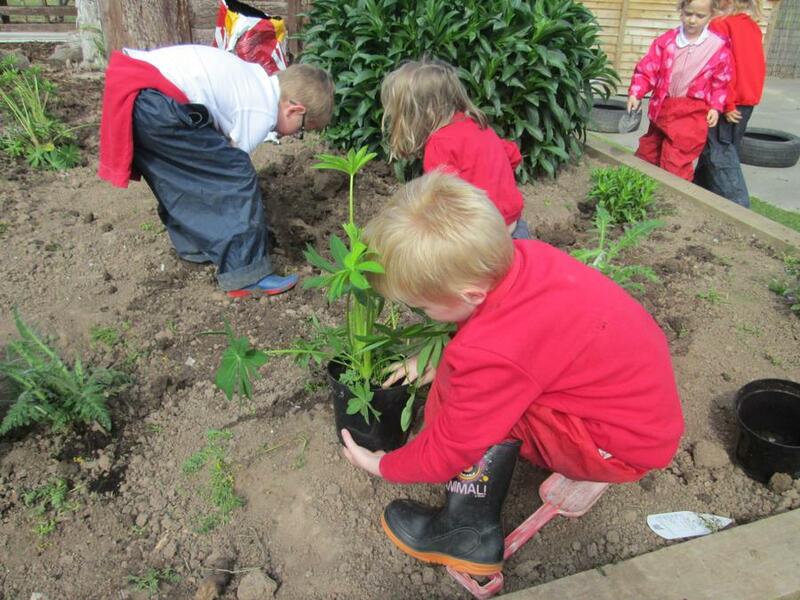 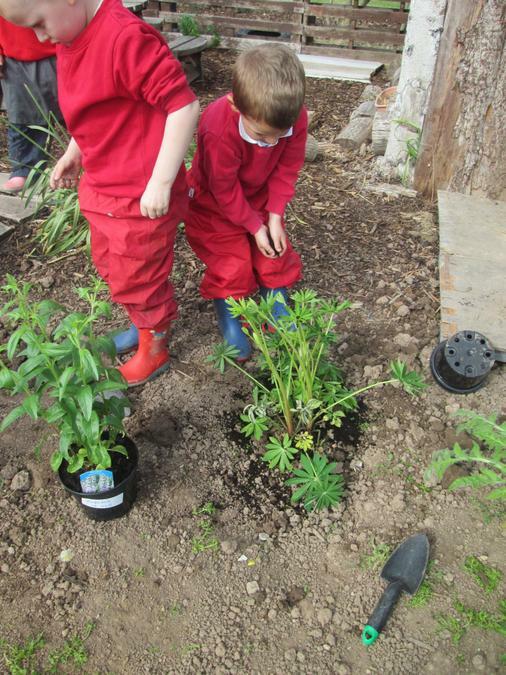 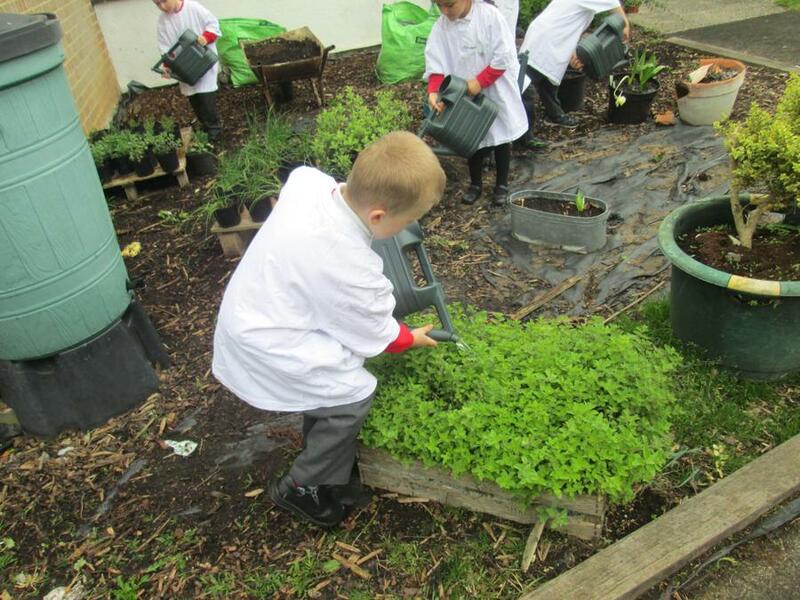 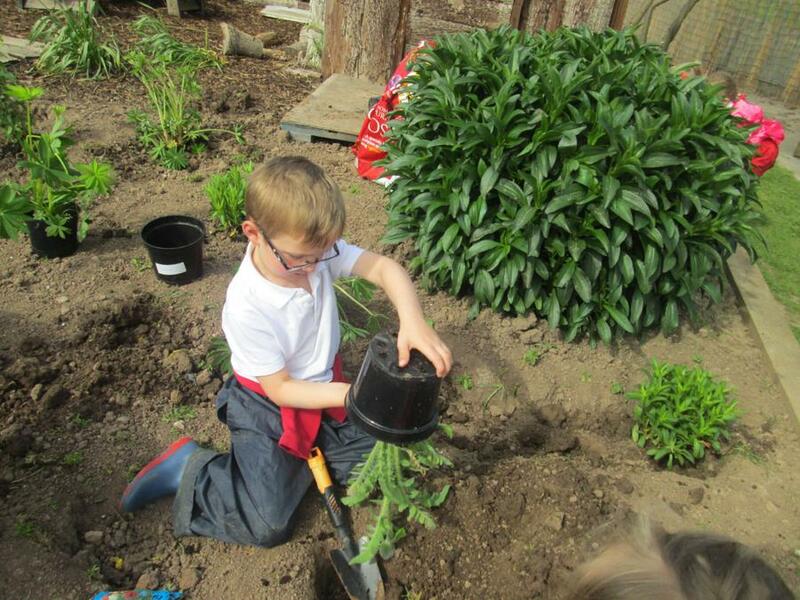 We have used what we have learnt from West haven in our garden and planted some more plants. 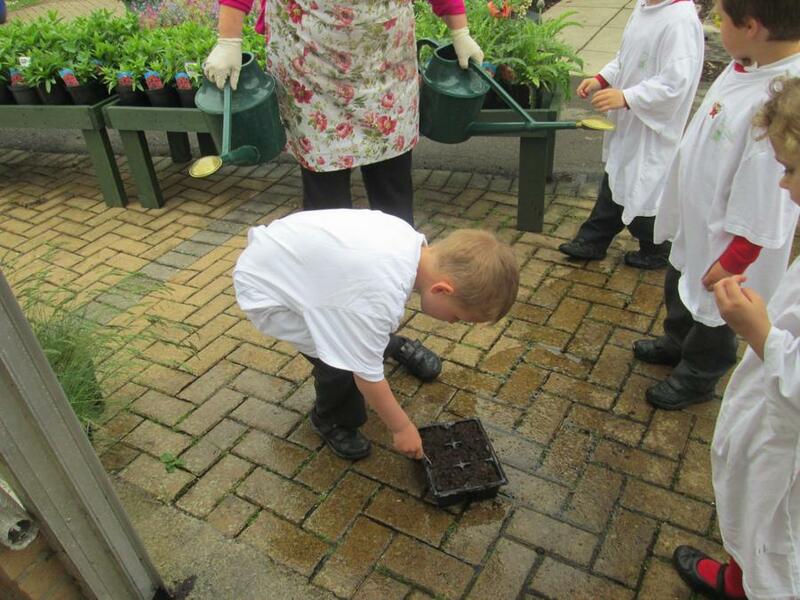 The children have looked after them and made sure they are watered and in the right place in the garden. 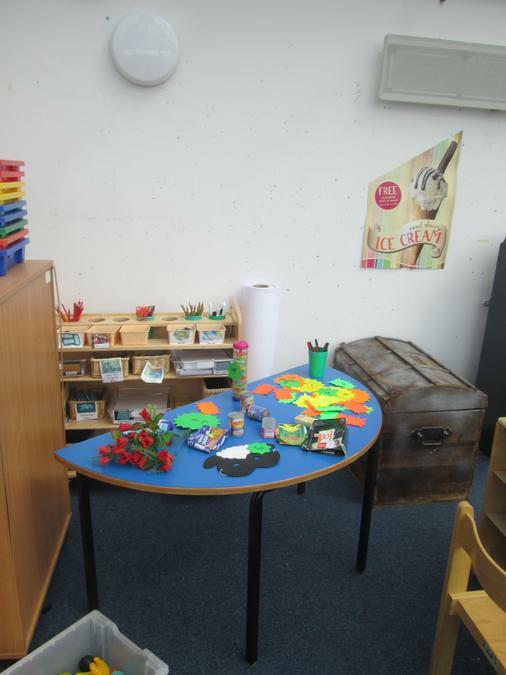 We are really looking forward to Term 6 with our new topic of Under the Sea.